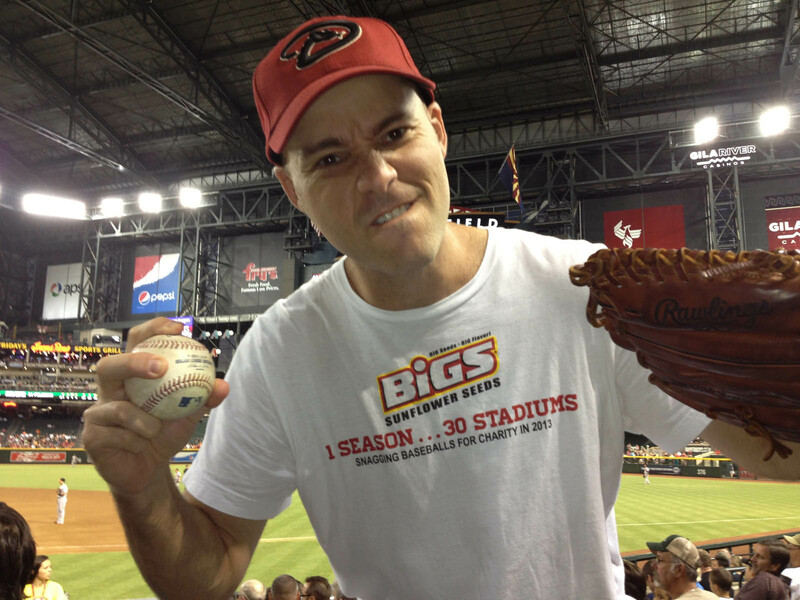 His name is Jeff Munn, and he works for the Diamondbacks as a public address announcer and part-time radio guy. 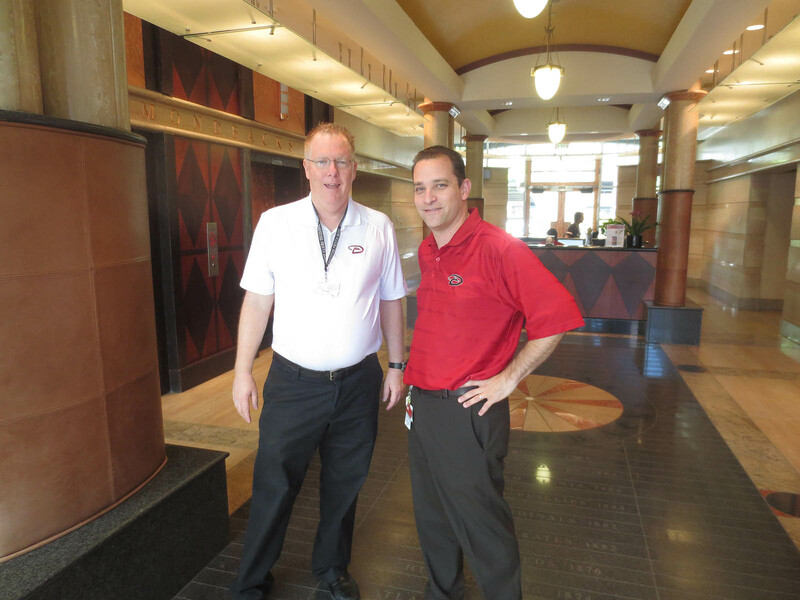 In the photo above, the man standing next to him is Josh Rawitch, the team’s Senior Vice-President of Communications. 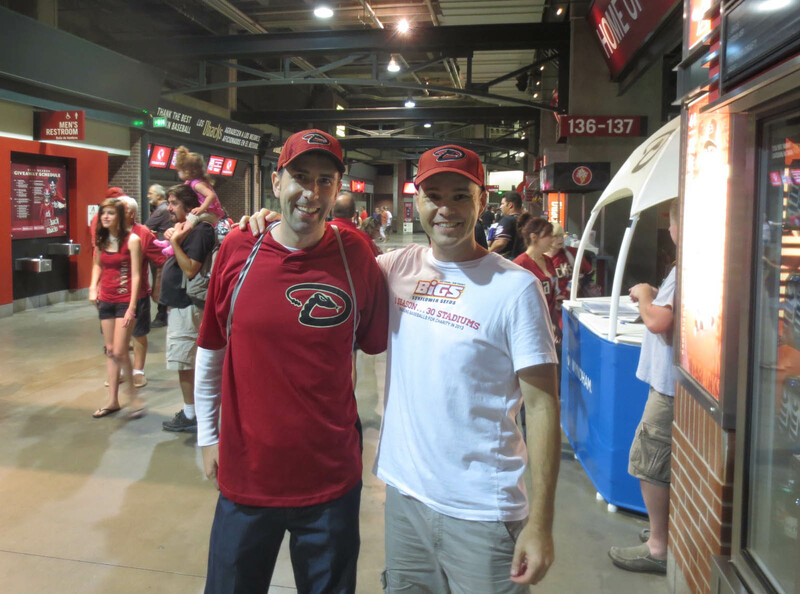 Josh had arranged for Jeff to interview me on the pre-game radio show, and voila! 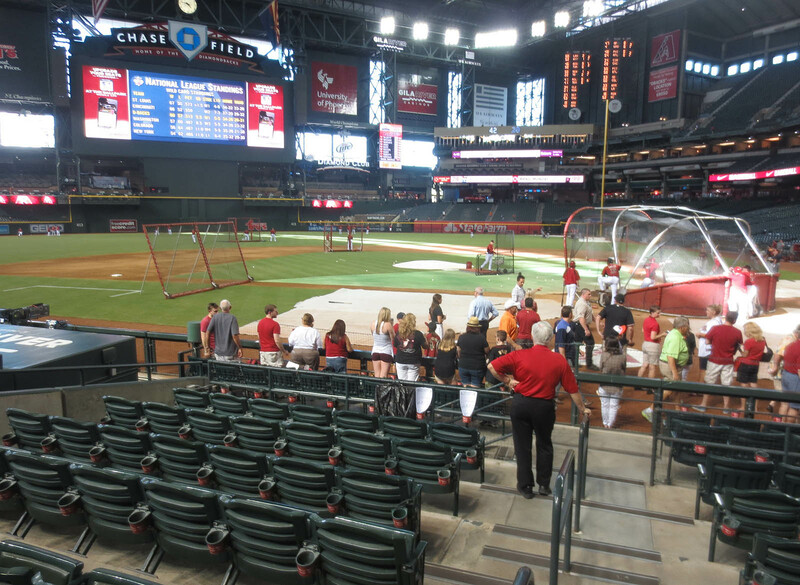 Here I was at Chase Field roughly three and a half hours before the first pitch. 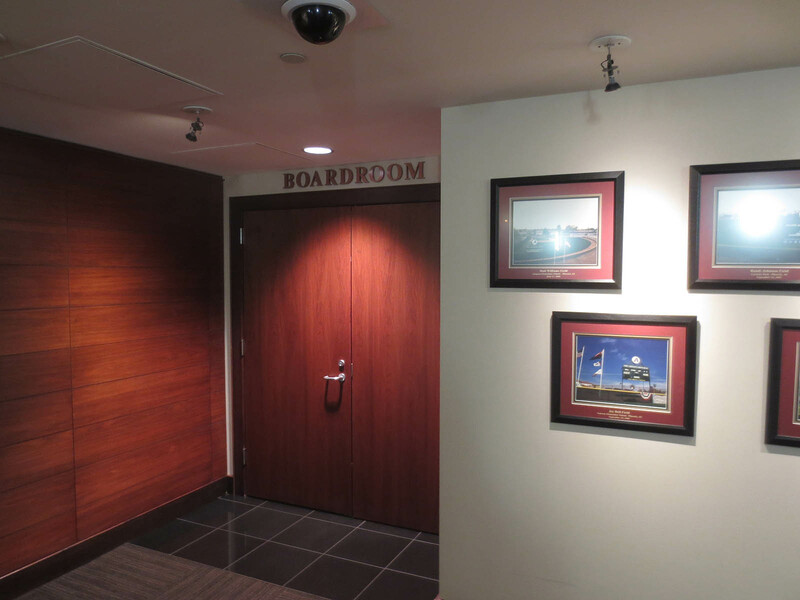 Then we headed through this hallway . . .
. . . where I was as intrigued by the boardroom . 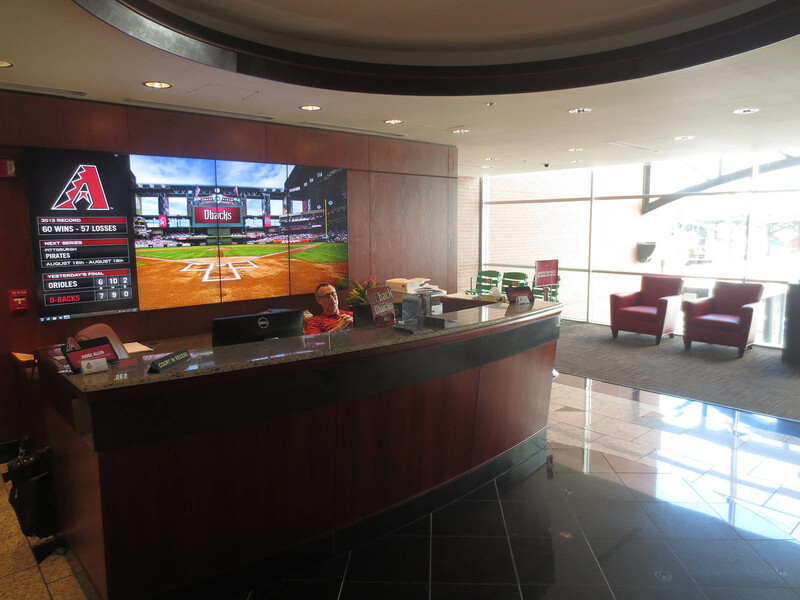 . .
We passed by a bunch of offices, which looked ordinary except for the fact that Luis Gonzalez was in one and Roland Hemond was in another. I felt like I was in a baseball sanctuary and made sure not to show how excited I was. 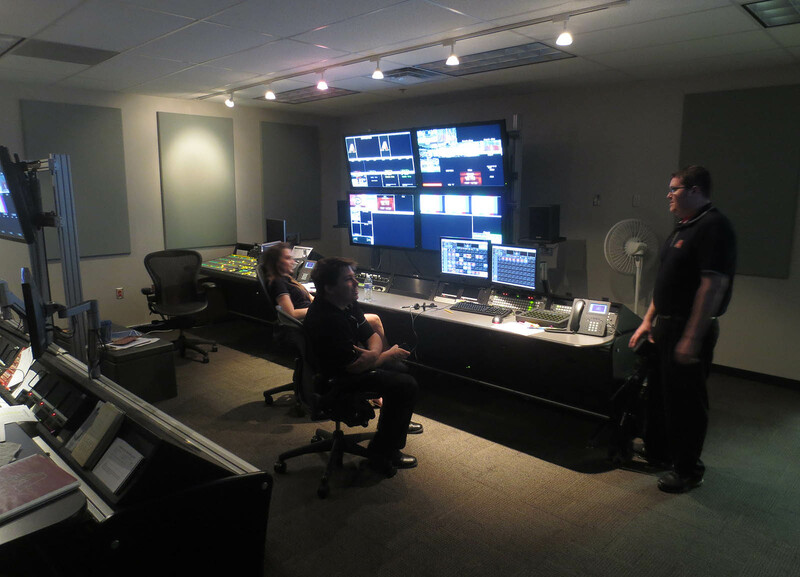 Jeff took me into a video editing room . . .
. . . and then we headed to the press area. 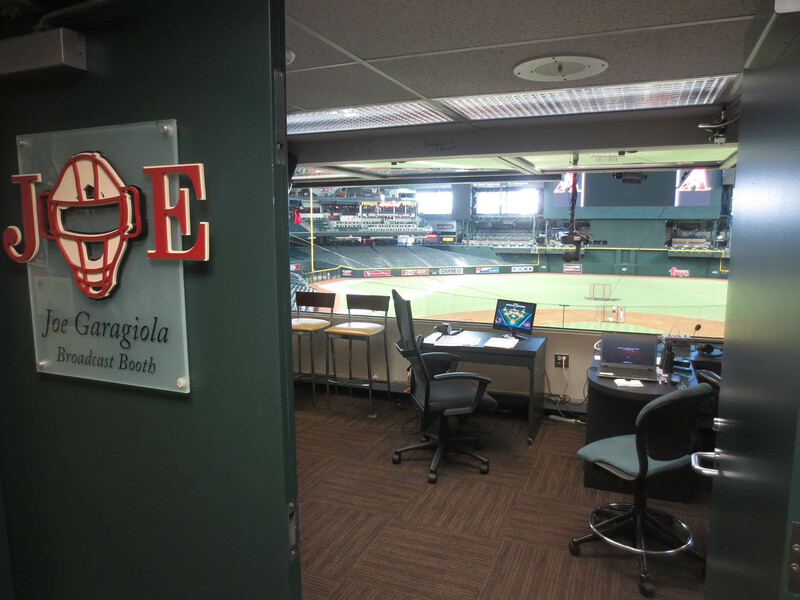 The main broadcast booth is named after Joe Garagiola . 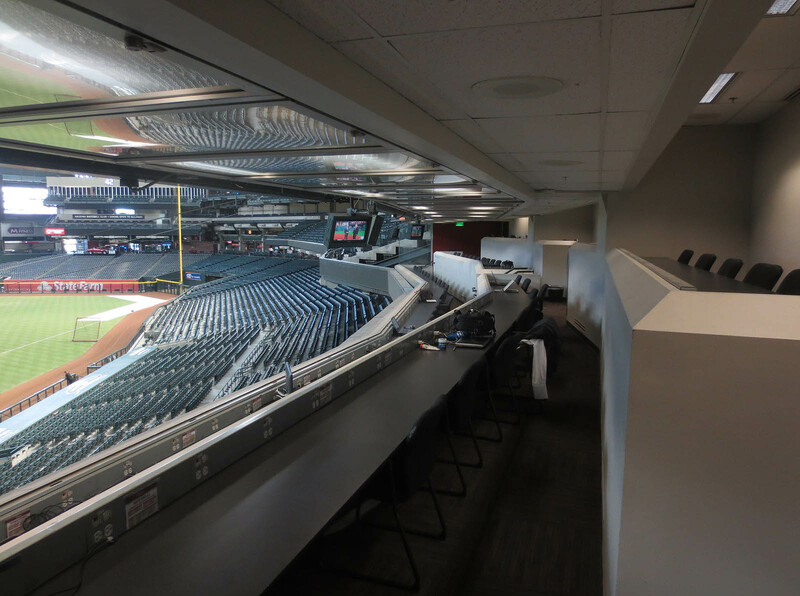 . .
Jeff showed me the press box . . . I took a quick photo of this . . . 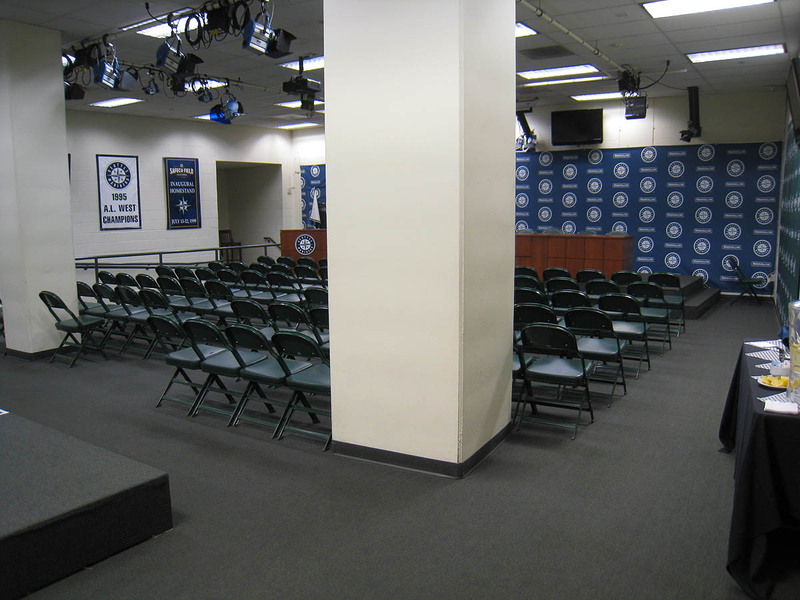 I would’ve taken some pics there, but (a) I didn’t want to bother the few people who were eating and (b) Jeff was in a hurry to get downstairs for Kirk Gibson’s media session. I followed him downstairs . 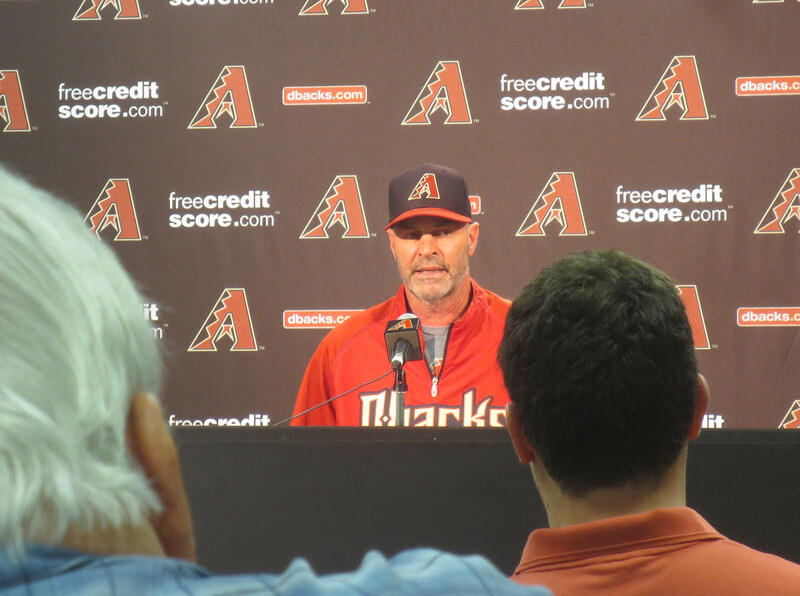 . .
Then, suddenly, the door opened and Diamondbacks manager Kirk Gibson entered the room. 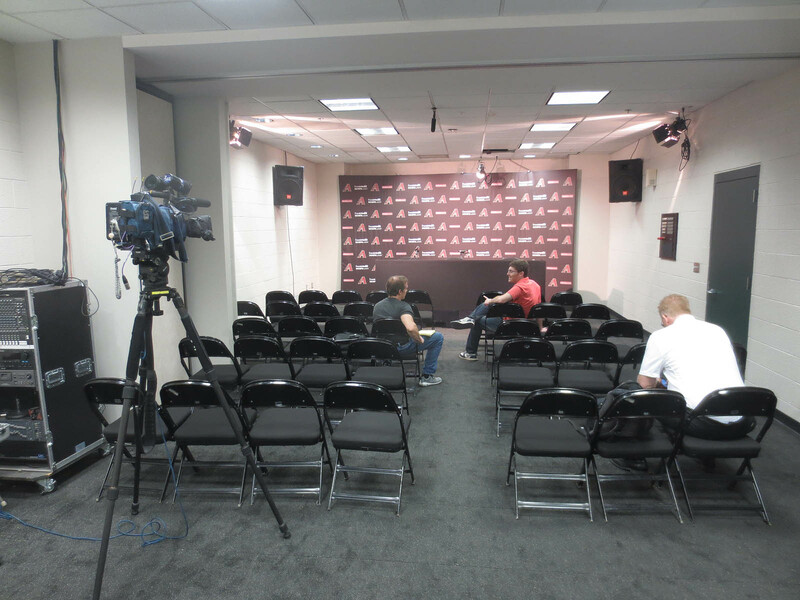 I had been expecting some type of announcement — was I supposed to stand and take off my hat? — but the whole thing was unceremonious. There were about ten other people in the room by that point, and no one exchanged any type of greeting. I thought it was actually kind of awkward, but maybe that’s just how these things go. 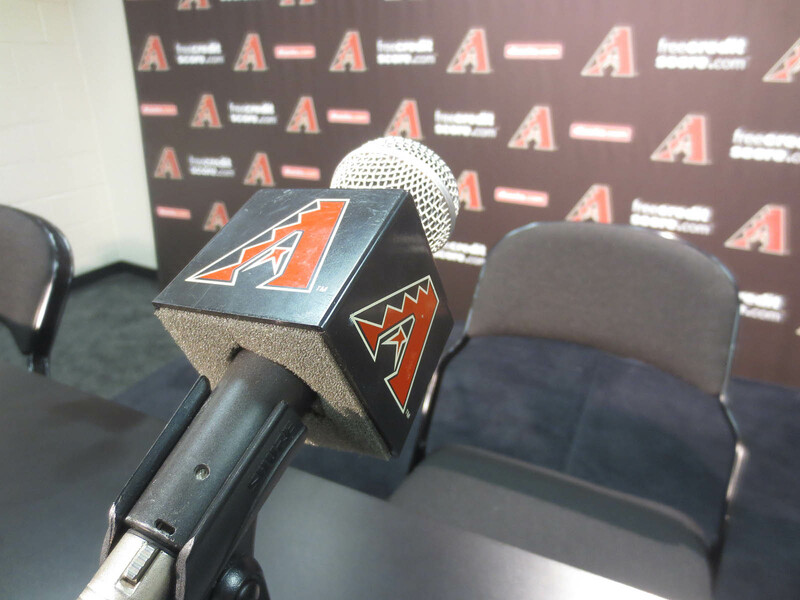 Gibby simply took a seat at the podium and stared out at us. Gibby has an odd demeanor. I’d seen him interviewed several times on TV, and he acted the same way in person. He seemed to be confused and irritated, almost like he didn’t want to be there and couldn’t understand why any of these people wanted to ask him questions. One of the reporters began a question by saying, “If the Dodgers win tonight, they will have taken 40 of their last 50.” Gibby was asked if he’d ever seen a team go on a run like that. He said he’d been on a team that had and added that it’s not fun to be on the other side of it. “At this point,” he said, referring to the Dodgers, “it’s pretty much historic.” Of course, he followed that by saying all the right things: there are still lots of games, and we have time to put together a run of our own, and blah blah. None of the questions and answers were riveting, but the whole experience of being there was tremendous. 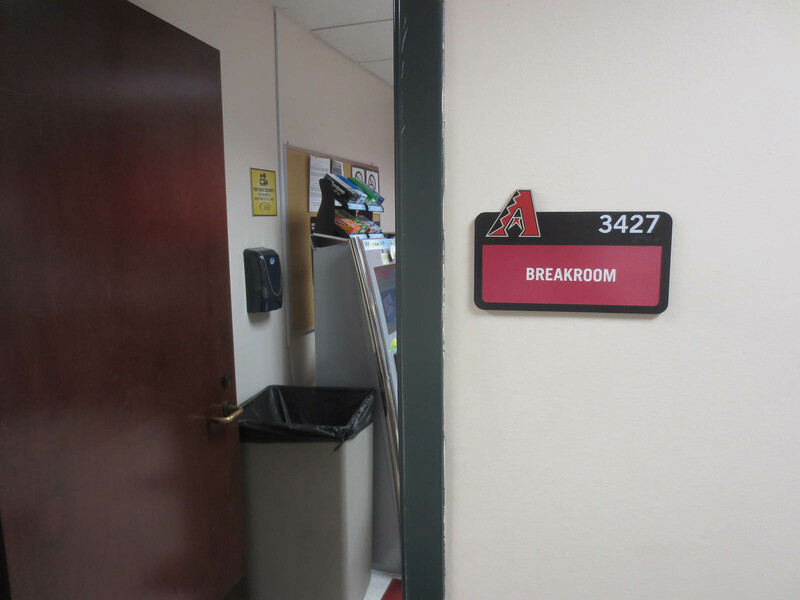 Many thanks to Jeff Munn and Josh Rawitch and the whole Diamondbacks organization for allowing me to take a peek behind the scenes. 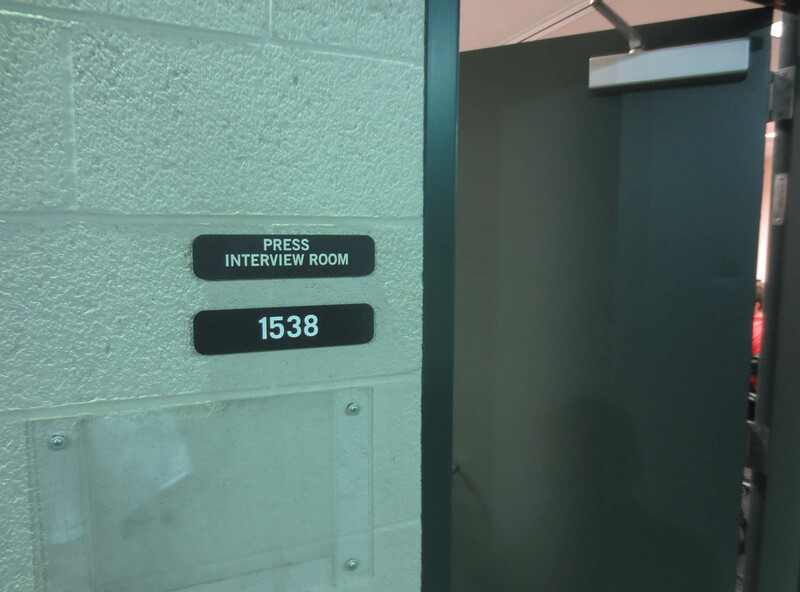 Even though my credential technically gave me clubhouse access, I didn’t go there. I made sure not to push the boundaries. 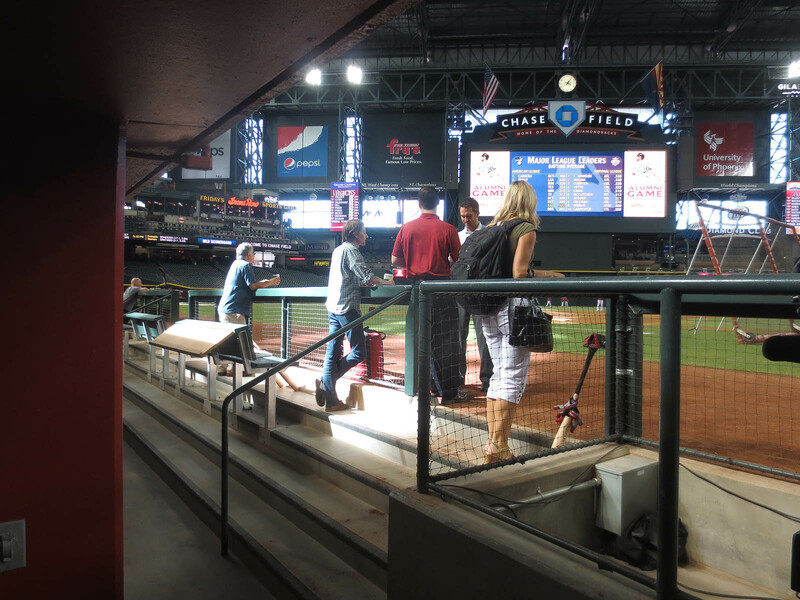 I wasn’t sure what to do with myself at that point, so when she invited me to tag along and check out the Diamondbacks’ batting practice, I was like, “Hells yeah.” Of course, I didn’t know exactly what she meant or where we were going — back up to the press box, perhaps? I didn’t ask questions. I just walked with her and took photos along the way, such as this . 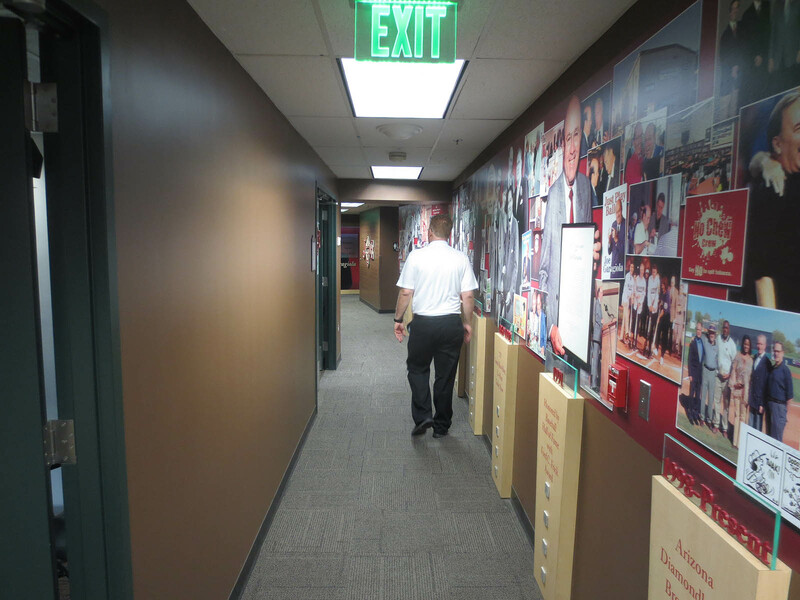 . .
One minute later, Jody took my picture in front of the Diamondbacks’ clubhouse . . . I had *no* idea where we were, which of course made the whole adventure extra-fun. What was I going to see next?! Actually, that’s not where I ended up. 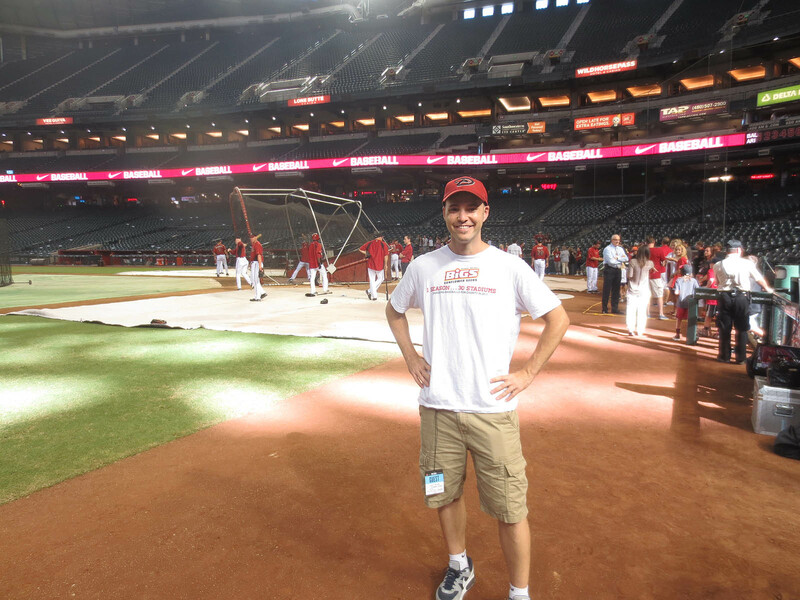 I was allowed to step out onto the field . . .
. . . and best of all, stadium security wasn’t threatening to arrest me. 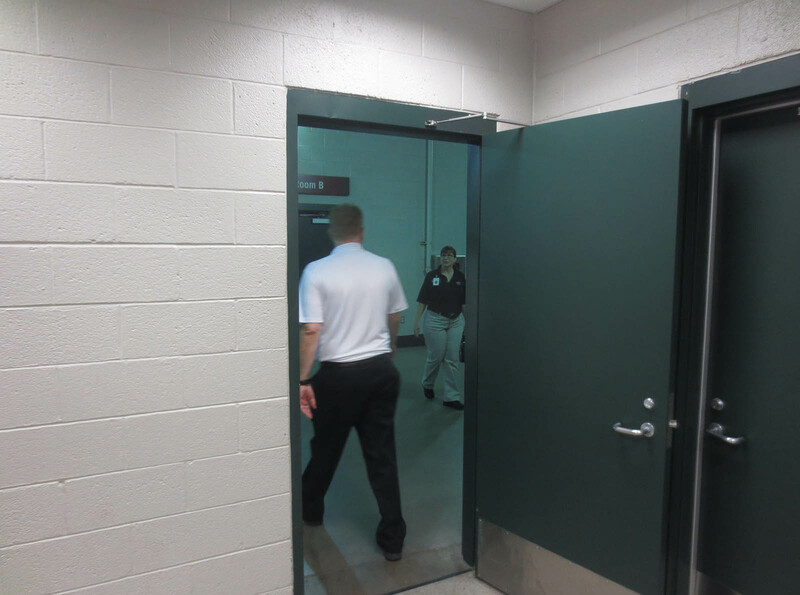 I talked to one of the guards, and he was very friendly. 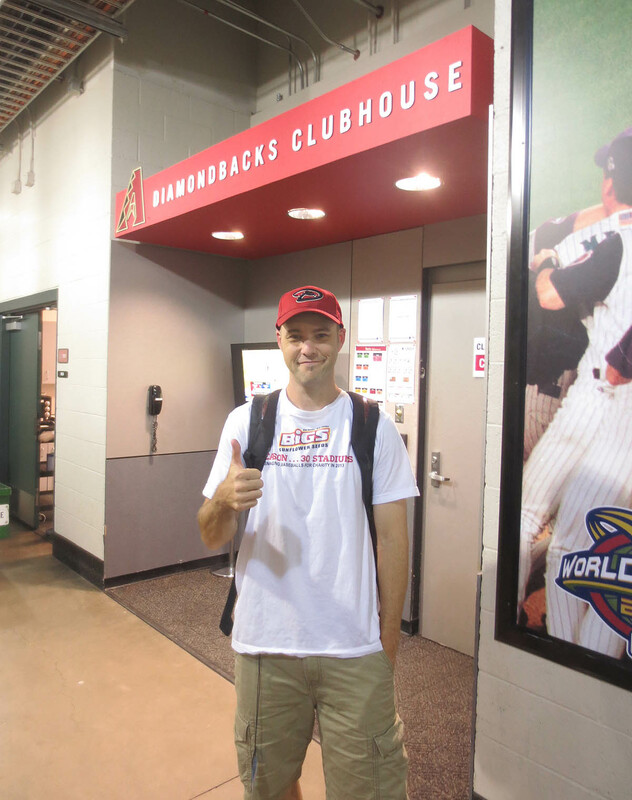 I talked to Pat O’Connell, the Manager of Player & Media Relations, and he was super-cool. Everyone was great. 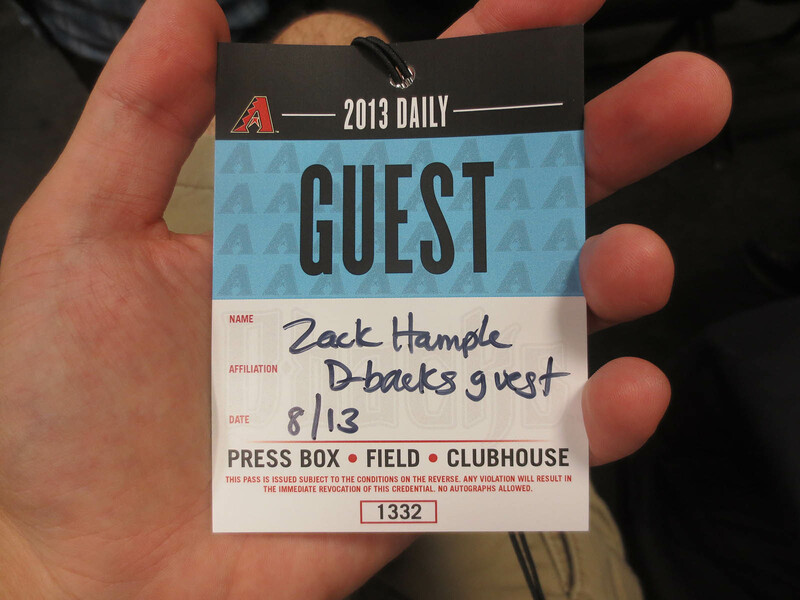 I truly can’t say enough nice things about the Diamondbacks. Even when Heath Bell no longer pitches for them, I’ll still be a fan. Snagging baseballs in the stands is fun. 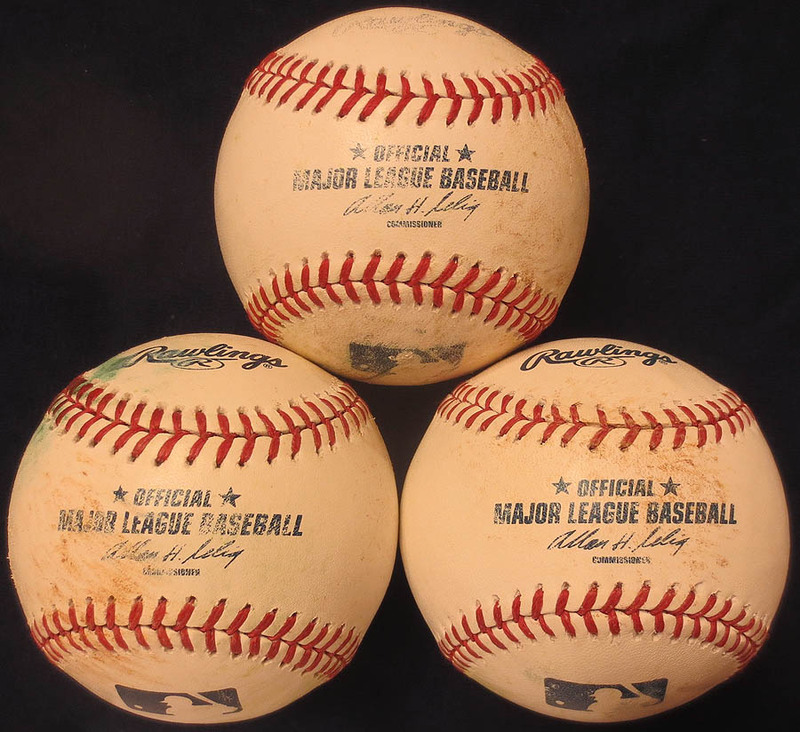 Stealing them from a ball bag on the warning track? Who gives a damn. That’s not my style, and yes, okay, I’ll admit that I’ve done a few sneaky things over the years AS A FAN in order to acquire a few extra baseballs, but now wasn’t the time. I wouldn’t have counted them in my collection anyway. Seriously, what would’ve been the point? It just would’ve made me feel bad/guilty. 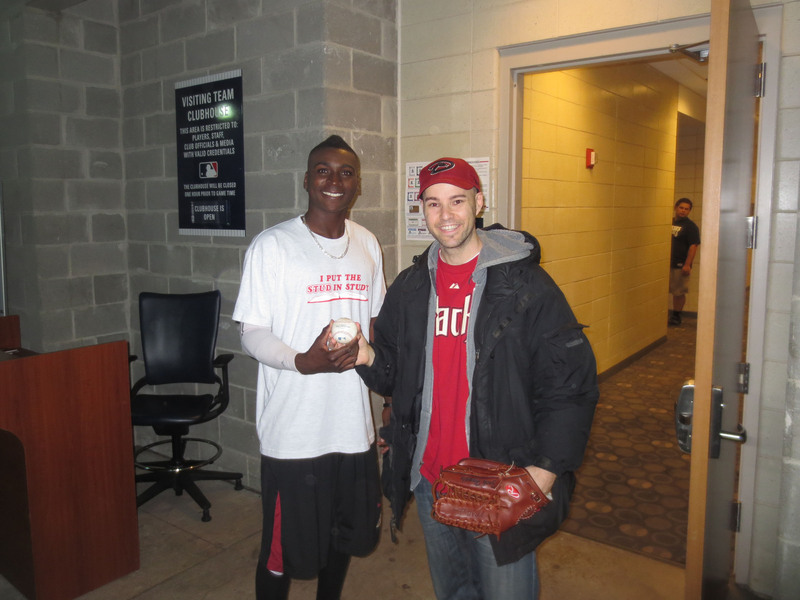 That’s Didi Gregorius, who graciously posed for that photo. 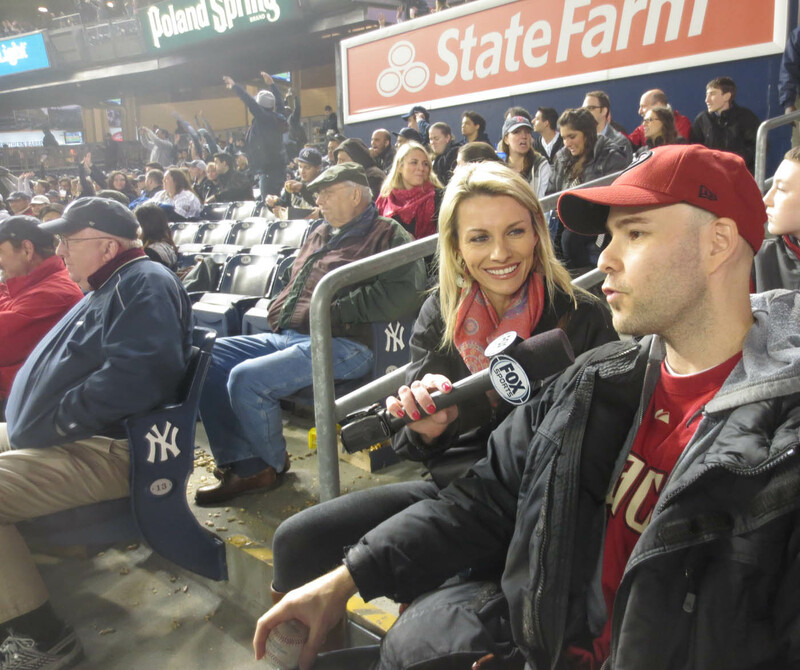 It was nice to see him, and yes, he remembers me from our post-game meeting back in April at Yankee Stadium. 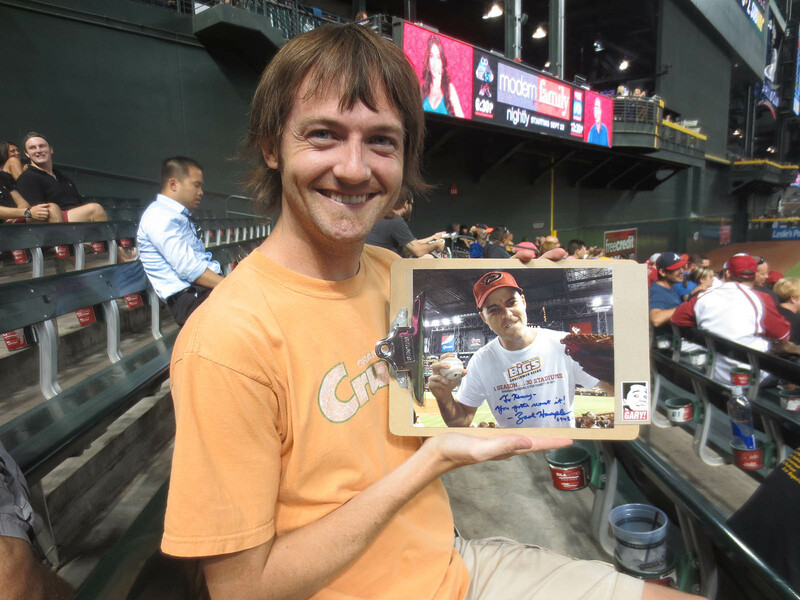 Here at Chase Field, we shook hands and chatted for a minute. 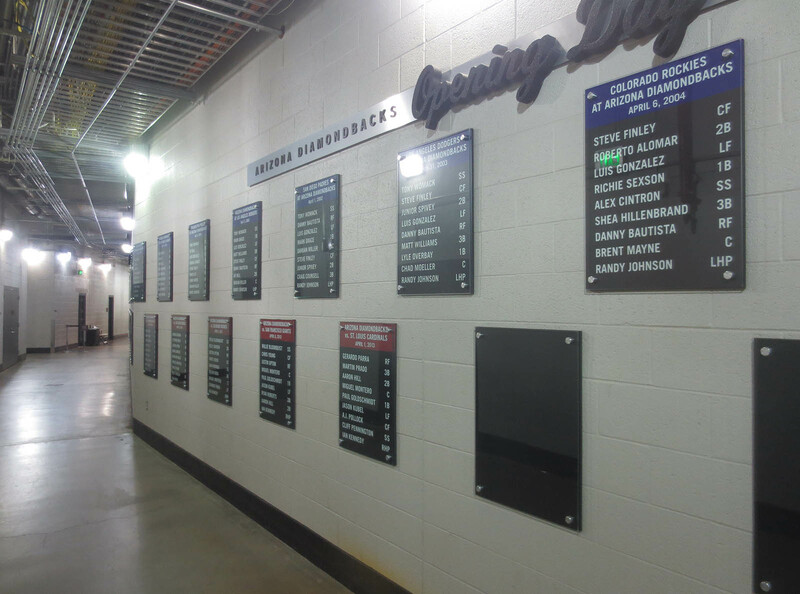 In the photo above, the player entering the dugout is Miguel Montero. At one point, perhaps ten or twenty minutes later, I accidentally knocked over his bat, which had been leaning against the bench. 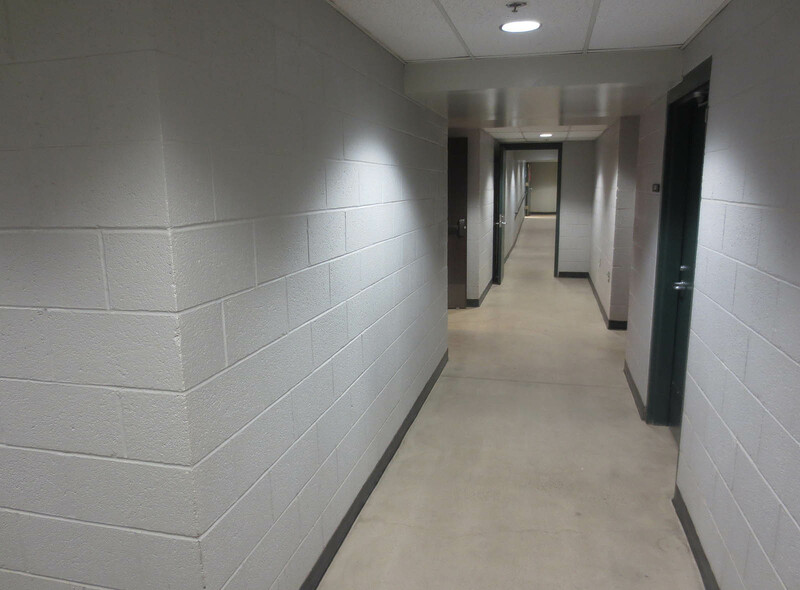 It made that awful clanking-on-concrete noise, so I quickly grabbed it and looked around as I put it back in place. I hoped no one had noticed, but guess who was standing right there? Yep . . . Miguel Montero. D’oh!!! He was wearing his batting gloves and standing on the dugout steps, and he reached his hand out toward me. I assumed he wanted the bat, so I handed it to him. Indeed, that WAS what he wanted, and within a minute, he was taking cuts with it in the batting cage. 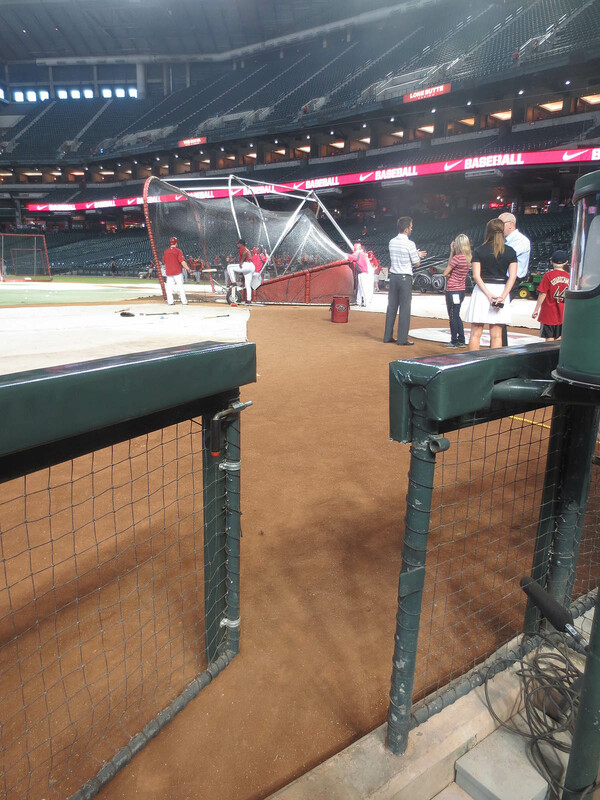 Then I took a pic of the batting cage . . .
. . . and tried to figure out what to do next. Out in left field, I found this . . . 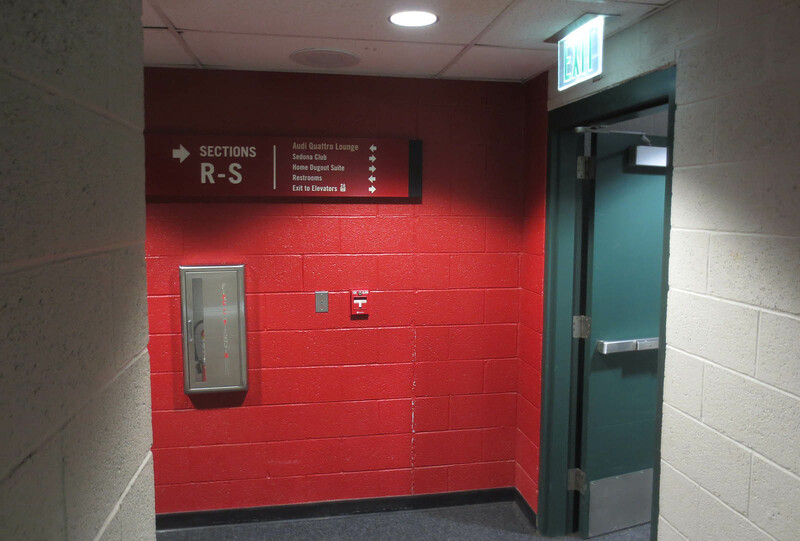 There were actually two other Easter eggs that I missed because (a) I’m dumb and (b) I’d given myself such a small head start on the season ticket holders that there wasn’t even time for me to scour the entire area. Several minutes later, with a handful of fans scattered throughout the bleachers, I jumped and caught a ground-rule double in the front row in left-center. I didn’t know who hit it, but one of the regulars was pretty sure that it was Jason Kubel. 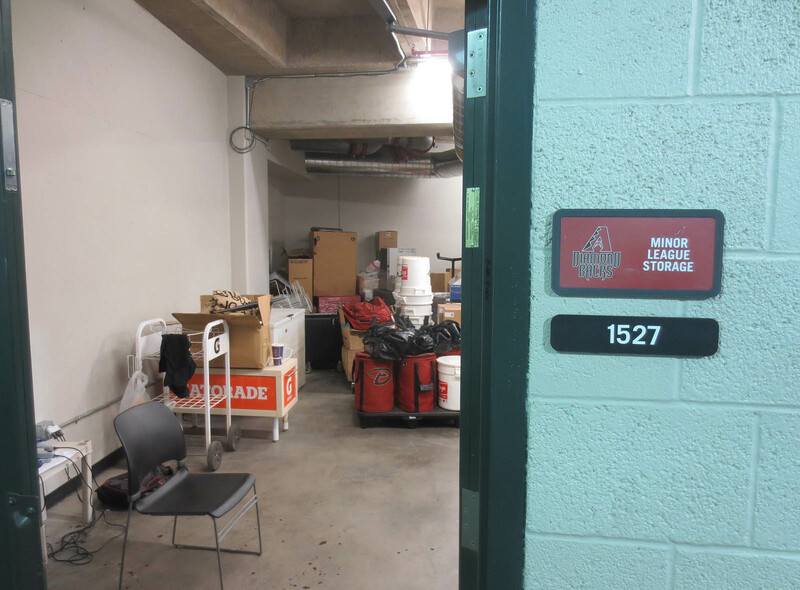 As much as I wanted to stay there and try to snag more baseballs, my paranoia about missing the players coming off the field was even stronger, so I headed back to the dugout . . .
For the next ten minutes, I cringed every time a home run clanged off the bleacher benches — and let me tell you, I did a LOT of cringing. 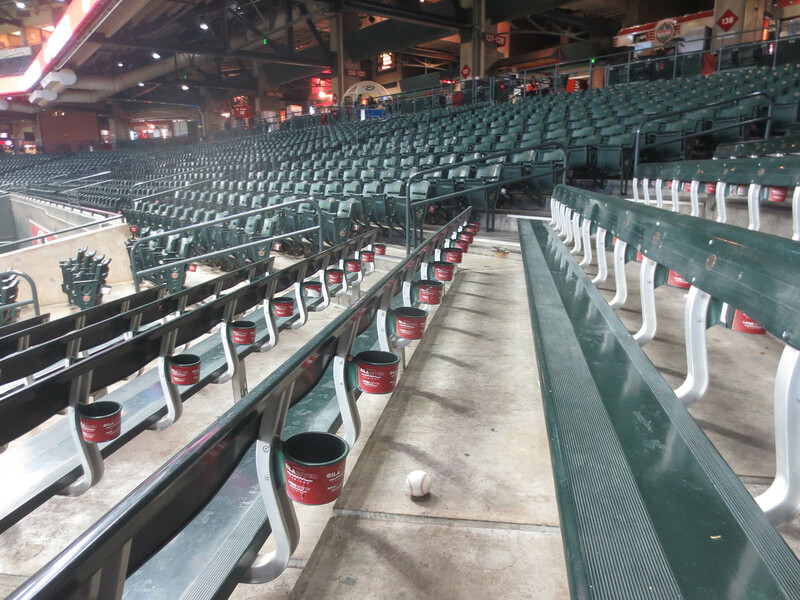 I think I would’ve gotten an additional half-dozen balls if I’d stayed out there while the D’backs were hitting. The missed opportunities hurt, but I still felt like I was doing the right thing. This was a once-in-a-lifetime situation, right? He stayed and talked for like 15 minutes. Jody was there too . . .
. . . so we all hung out. 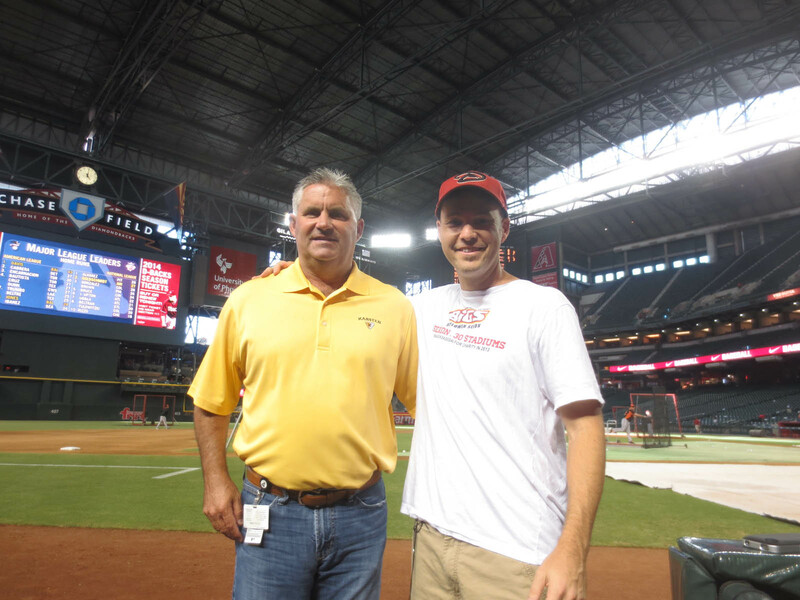 At one point, Diamondbacks general manager Kevin Towers walked past me and headed onto the field. I asked Heath and Jody if they thought he’d mind if I asked to have a photo taken with him on his way back in. They said he’d be fine with that, so I told Heath that I wanted *him* to take the photo. “I’ll do it if he comes back here within the next two minutes,” he said. After Towers headed off, Heath asked me about my baseball collection. More specifically, he wanted to know if I held the Guinness World Record for most baseballs, so I told him the story. (The short version is that I don’t hold any “official” Guinness World Records because they make everything insanely difficult/expensive.) Then we talked about records in general, and I mentioned that I have the highest score ever on Arkanoid. 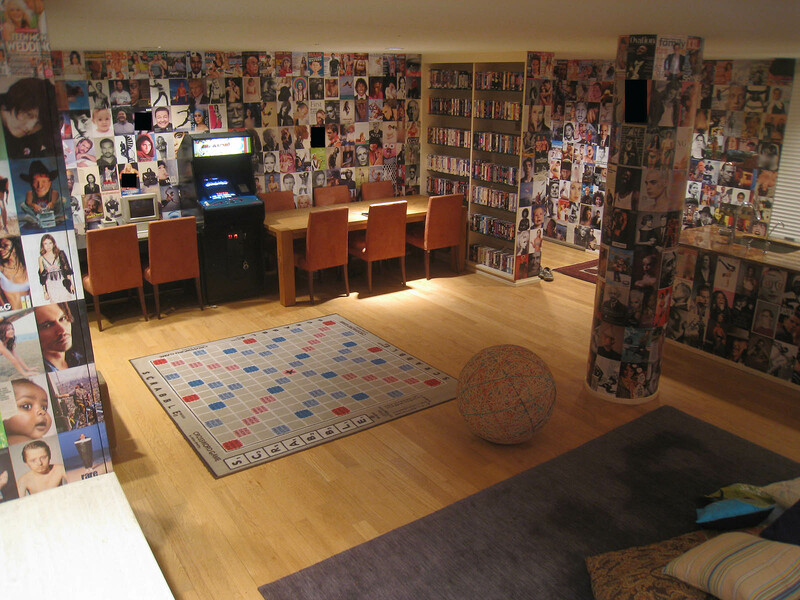 I told him that I have a full-sized/coin-operated Arkanoid machine at my apartment in New York City and that he should come over and play sometime. “Maybe next season,” he said. Before he took off, he grabbed a ball from a nearby equipment bag and flipped it to me. At first, I wondered if I should count it in my collection. After all, I was *on* the field, so it seemed to contradict my ballhawk rules. 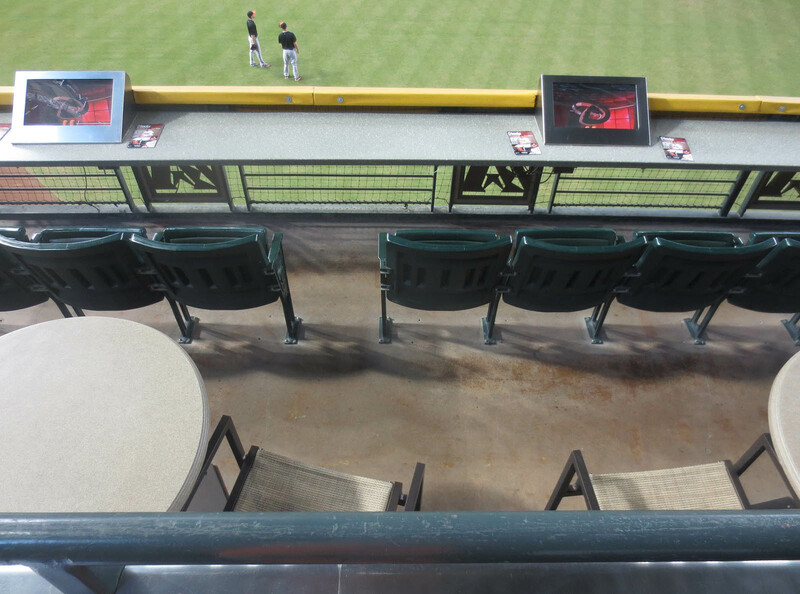 But then I thought about fans who get to watch BP from the warning track, whether in the outfield or behind the plate, and how *they* can snag baseballs. Wait a minute . . . I’d gotten a few that way too. 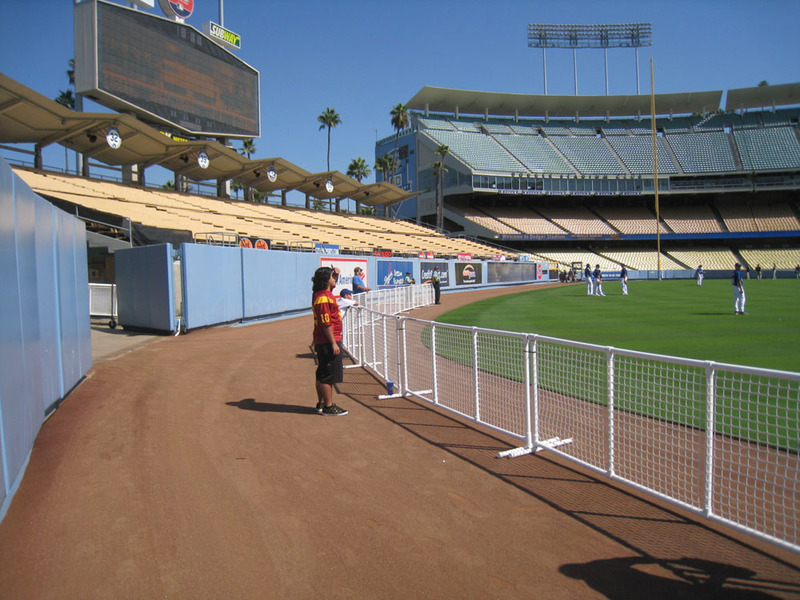 Remember when I hung out here on 9/1/08 at Dodger Stadium? I decided that being on the field doesn’t automatically negate a snag. It all has to do with the way in which the ball is acquired. 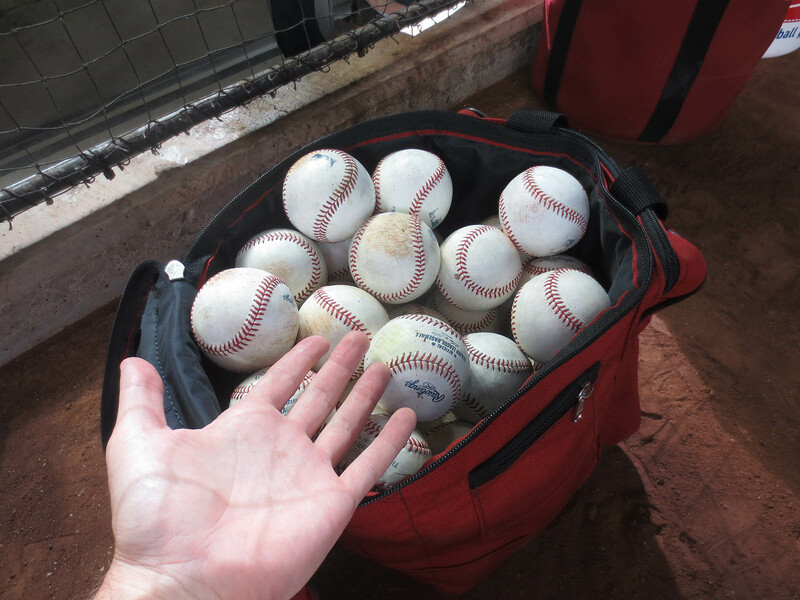 If I’d grabbed one myself from the ball bag, that wouldn’t have counted, but because a player had given it to me . . . why not? Therefore, that was my fourth ball of the day. 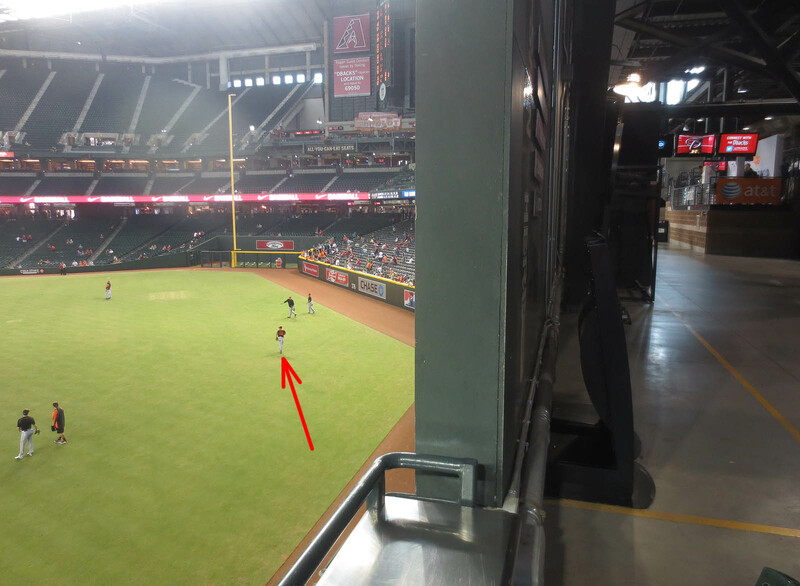 As you can see, I was standing in the concourse in deeeeeeep right-center when Chris Davis launched a home run in my direction. The ball ended up landing on the balcony below me . . .
. . . so I jumped down there and grabbed it. 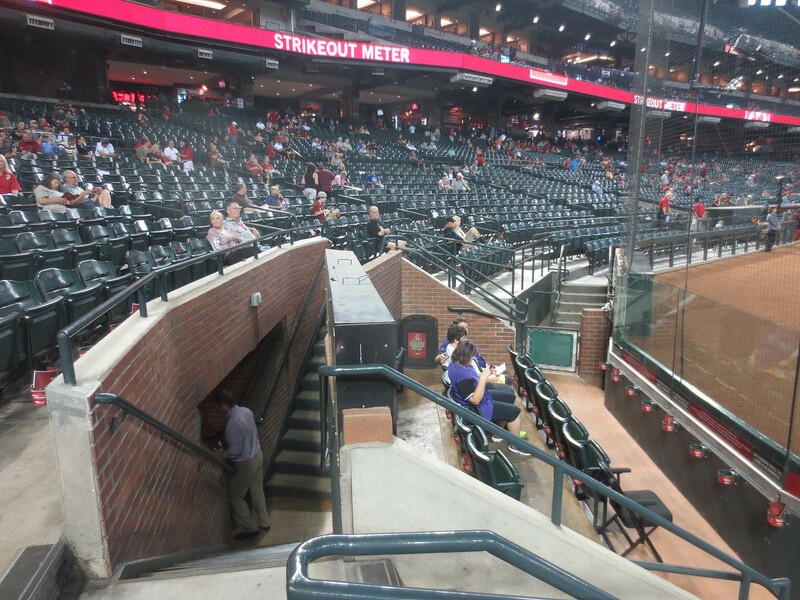 If I tried something like that at Yankee Stadium, I’d end up in solitary confinement at Riker’s Island for a month, but here at Chase Field, no one said a word. 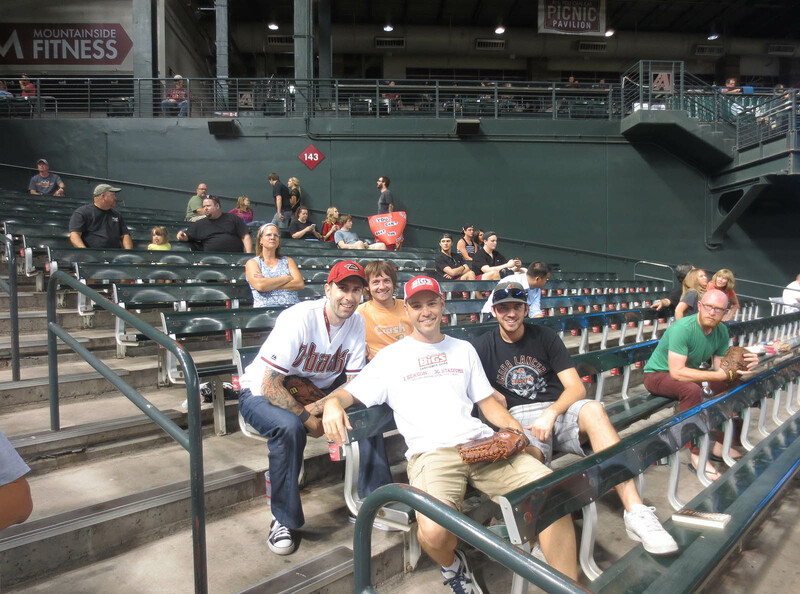 I really really LOVE Chase Field. 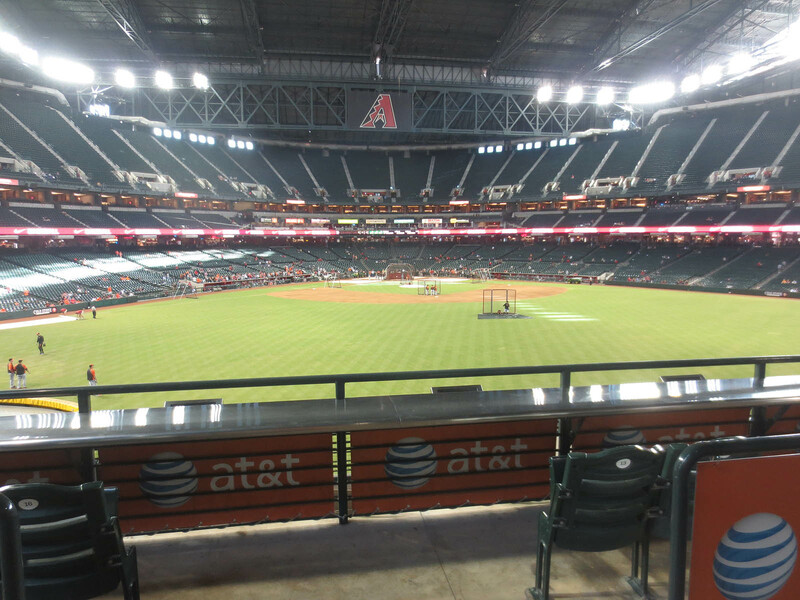 From an architectural standpoint, it’s not the best stadium for catching baseballs, but from an overall-happiness standpoint, it’s at the top of the list. 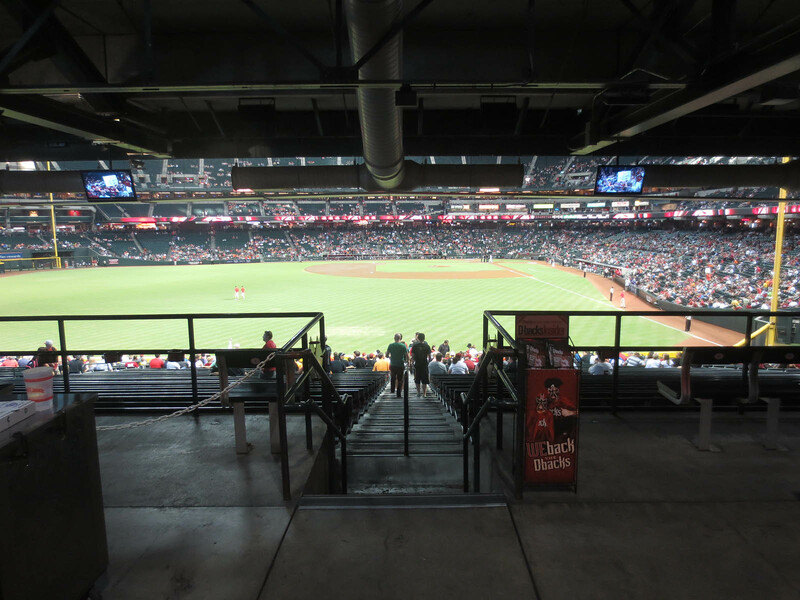 If you haven’t been there, you should make a point of visiting, and if you’re not a fan of any other team in the NL West, you should consider rooting for the D’backs. He was closer when he threw it, but that photo was taken in the spot where I was standing. 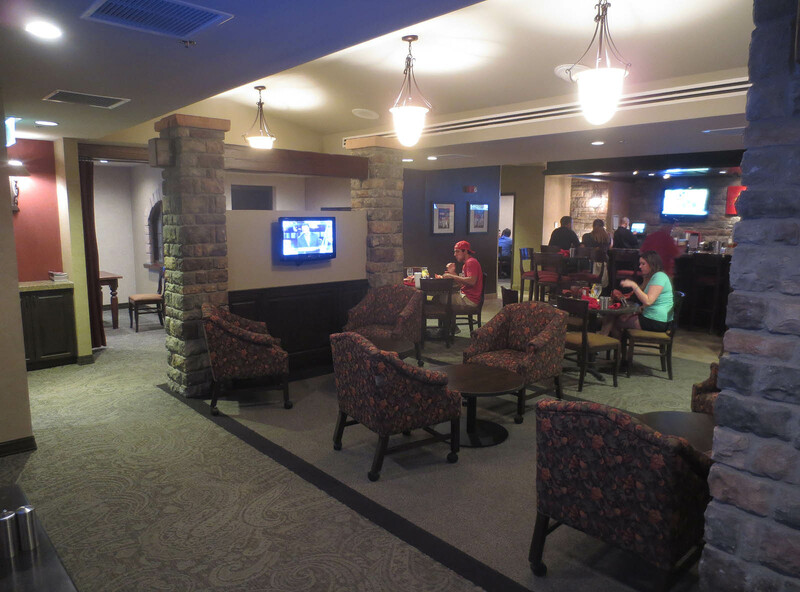 Of course, he ended up airmailing me, so I had to scamper after the ball in the concourse. As soon as I grabbed it, I noticed a little kid ten feet away, who was just starting to run after it himself, so I walked over and handed it to him. 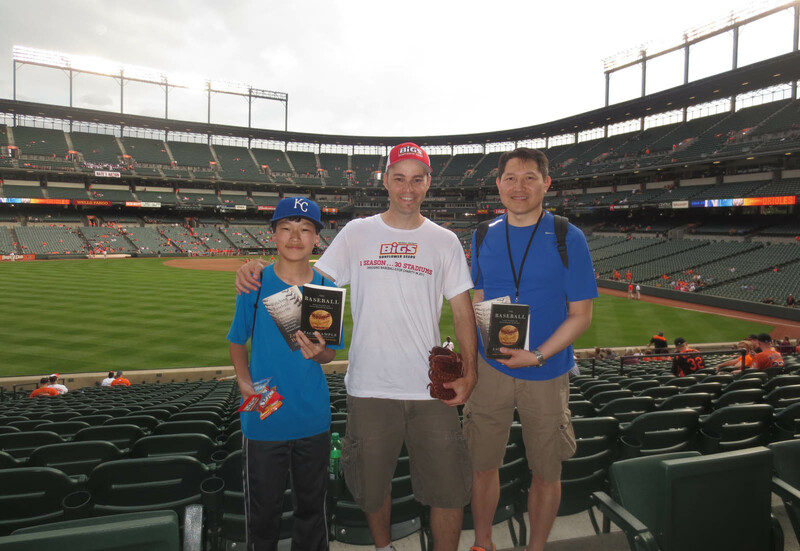 I didn’t get any toss-ups at the Orioles’ dugout after BP, but I did sign two autographs. The first was on a ball that this guy Jake had snagged . . . I did some more wandering before the game started. 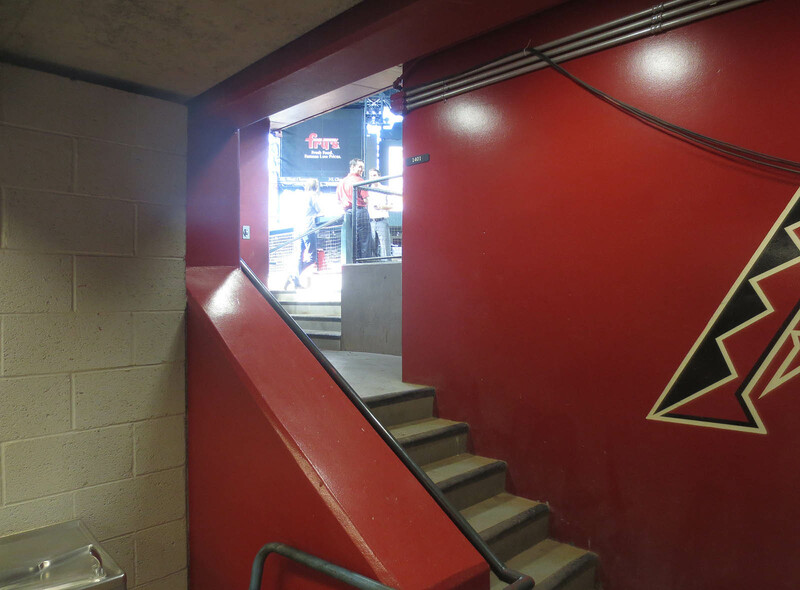 I headed down this staircase . . .
Not bad. Cozy. I dig it. 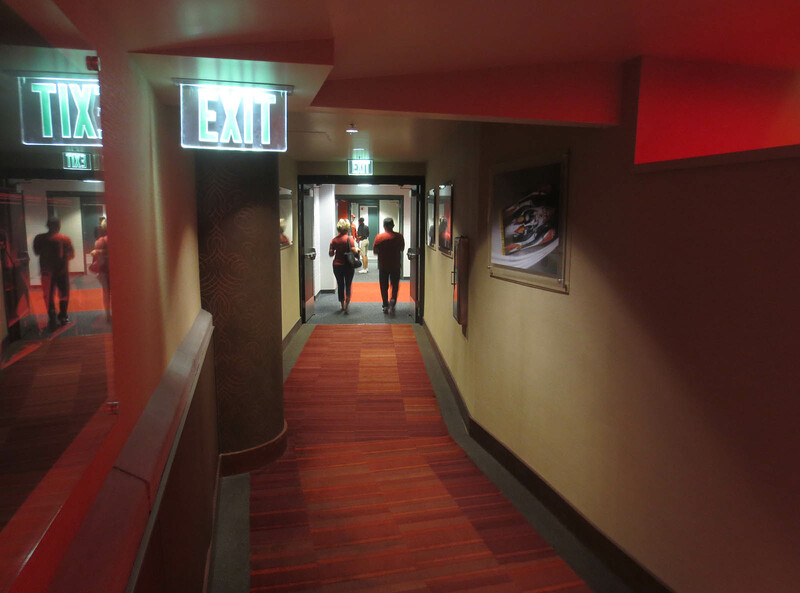 The far end of the club has a hallway . . . I kept walking and ended up here . 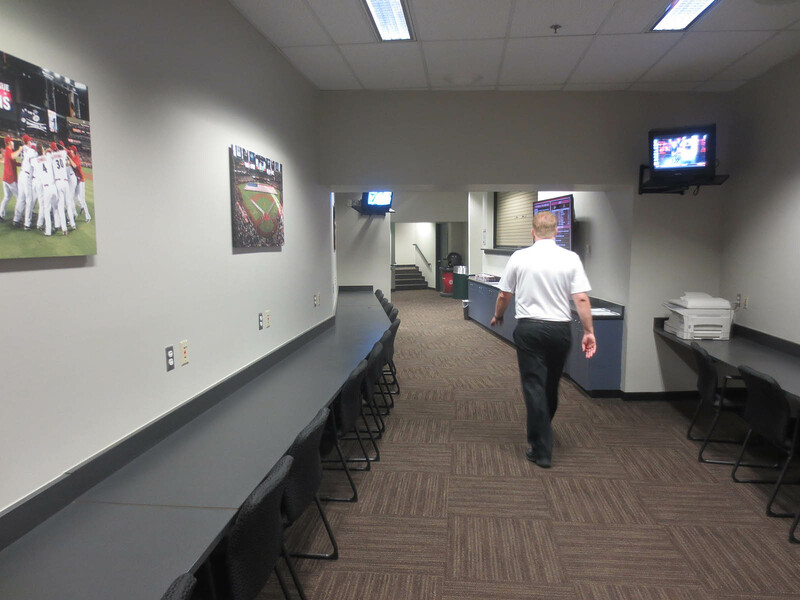 . .
Then I turned right and headed through a corridor that led to the seats beside the 3rd-base dugout. 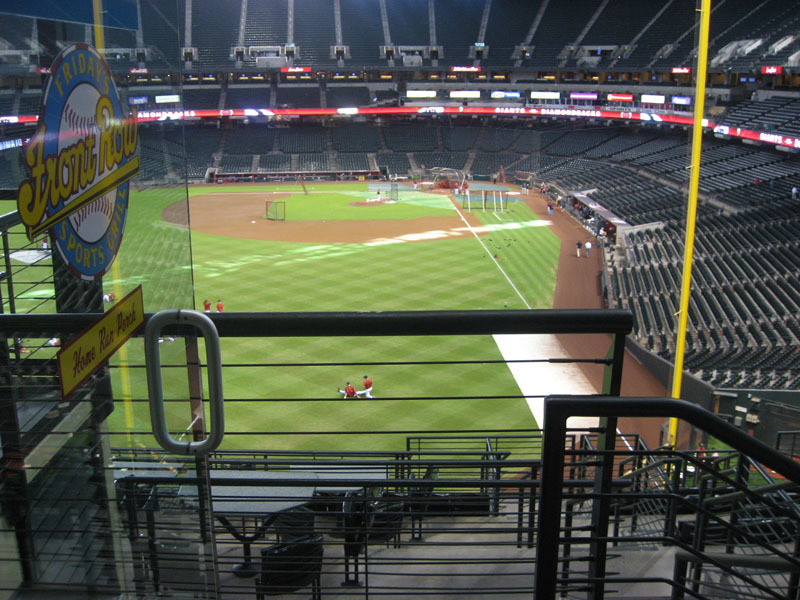 CHASE FIELD IS THE BEST. 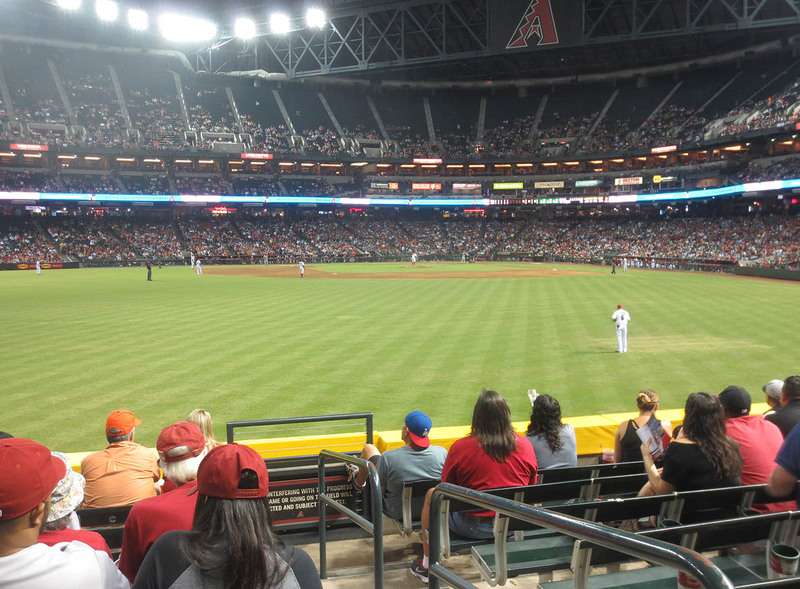 In the photo above, did you notice the lack of infielders on the left side? The shift was on for Chris Davis. Just when I was thinking that he should bunt down the 3rd-base line, he blasted a two-run homer to right. That was his 44th longball of the season. Incredible. Ha!! How awesome is that? 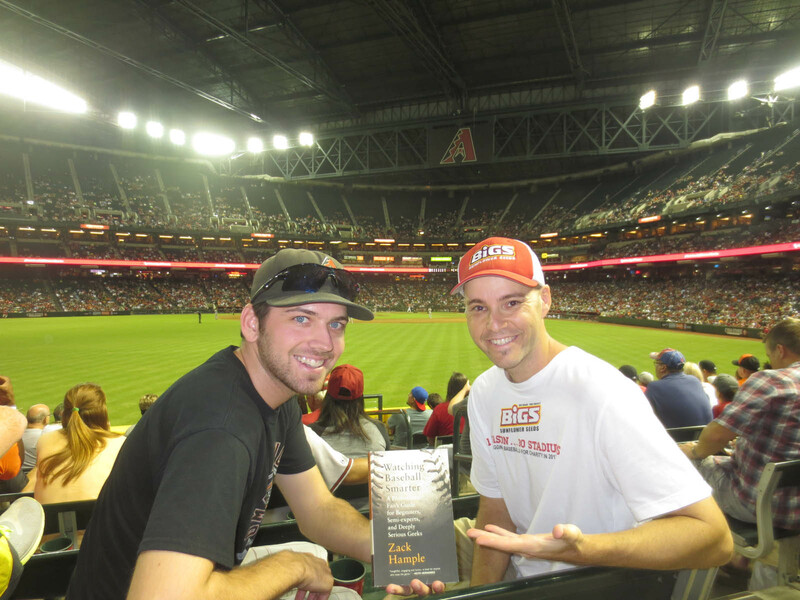 The photo that he’s holding had been taken the previous night after I snagged a 3rd-out ball. Kenny printed it off my blog. He’s hilarious guy, and it was great catching up with him. How sweet would it have been to catch his game-ending home run? The answer is: I don’t know because he grounded out. 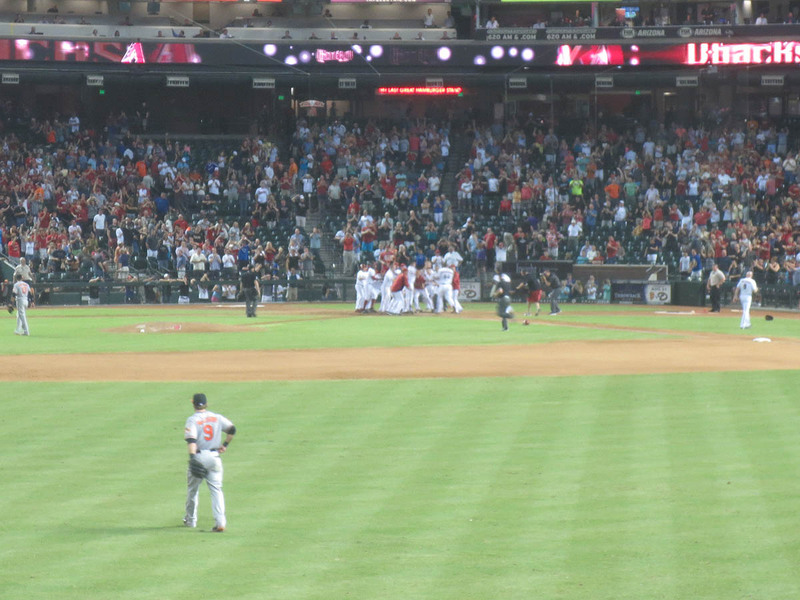 The best part about this homer was that it gave Heath Bell the win. Bell had entered the game in the top of the 11th and retired the Orioles on six pitches. Of course, I probably could’ve retired them on five pitches. On my way out, I gave two baseballs to a pair of little kids. What a great night in Phoenix. Now, if only the Dodgers would lose 40 of their next 50 . . .
• 484 balls in 64 games this season = 7.56 balls per game. 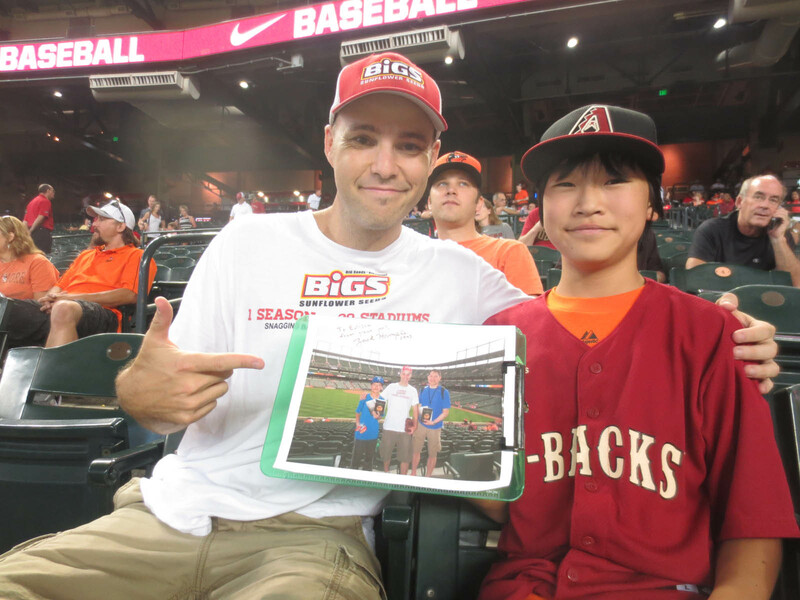 • 84 balls at 9 lifetime games at Chase Field = 9.33 balls per game. I think it’s safe to say that you’ve got a new team to root for, Zack. Enjoy being a DBacks fan. Incidentally, I have thought about living in Phoenix after I graduate college and get my teaching certificate. 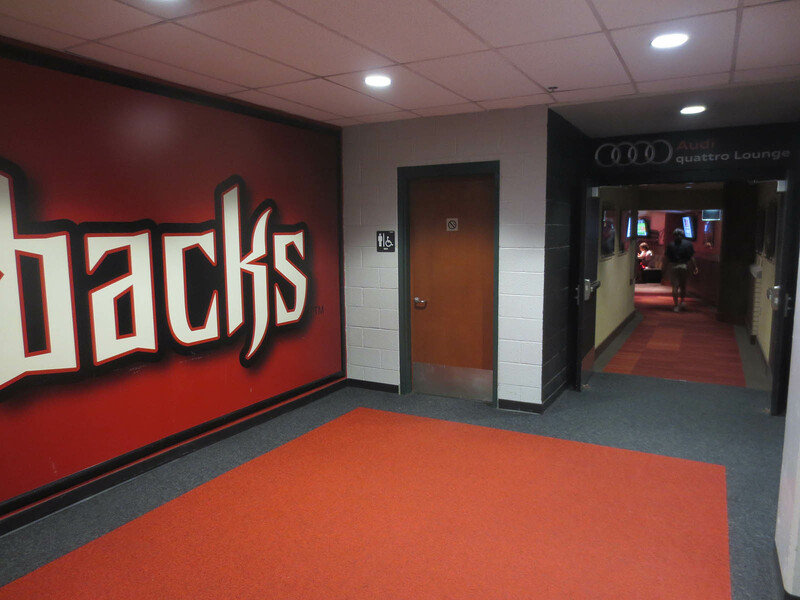 Maybe I’ll become a closet DBacks fan. Wow! 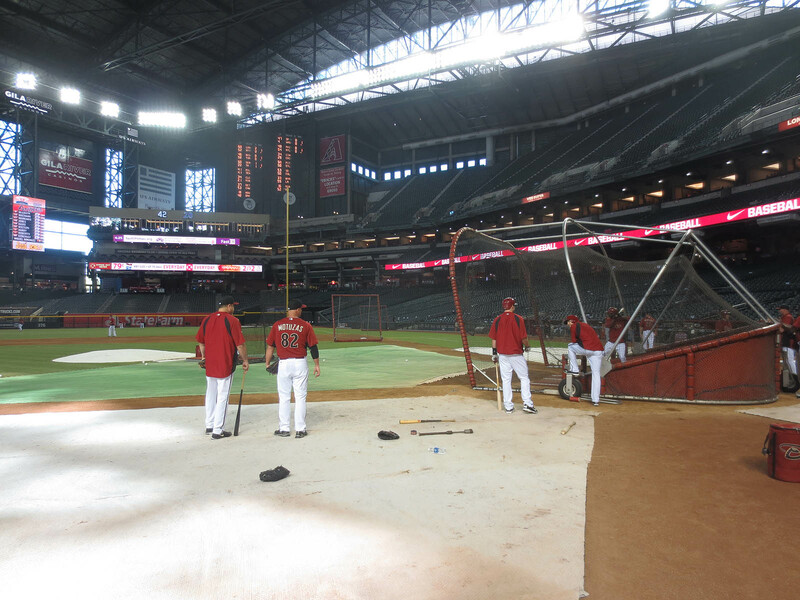 Chase field looks like a lot of fun. Sounds like a pretty fantastic day. You definitely should’ve asked Gibby a question. 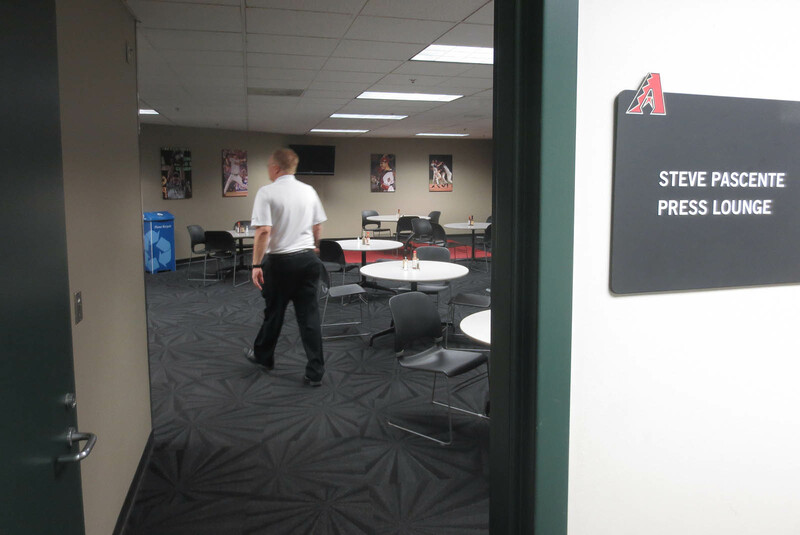 Thanks for sharing with us the behind the scenes tour of Chase Field! Most of us will never get to see all of those areas. 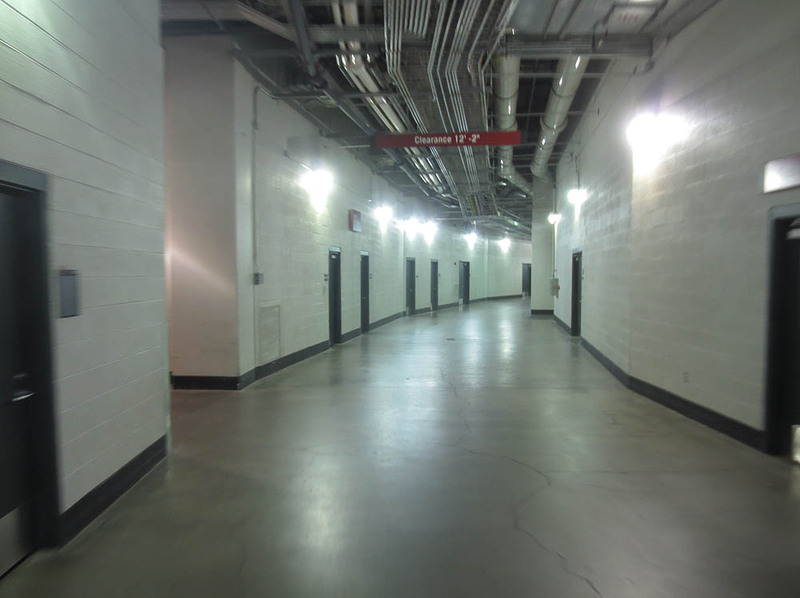 I stepped on a major league field for the first time on Tuesday at Nationals Park, and it was really cool! We had an employee with us the entire time, not the kind of freedom you enjoyed. 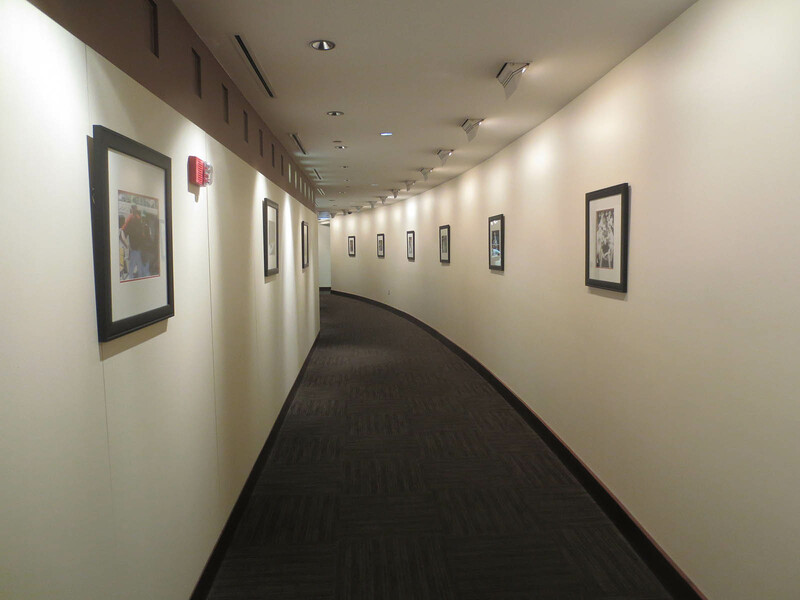 Autograph collectors would love the kind of access you had… Jodi seems to be such a great person to get to know. 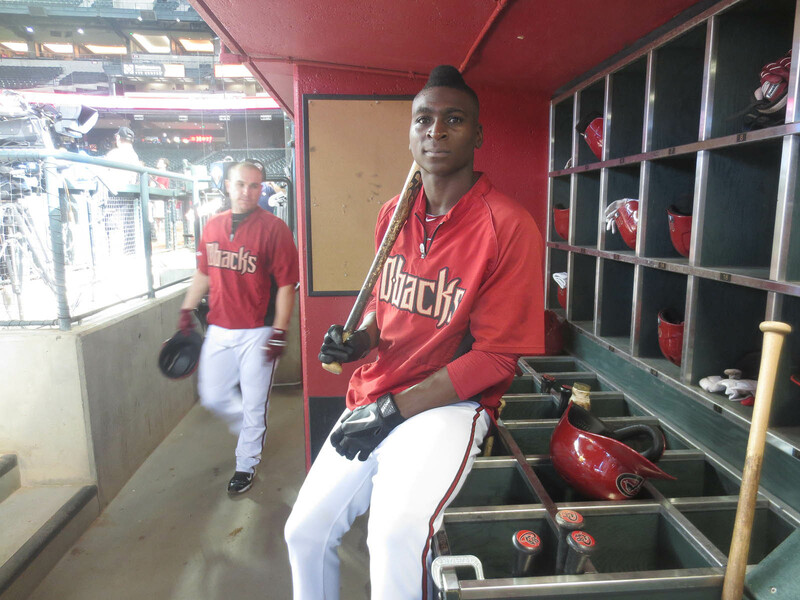 Awesome pictures of Gregorius and Bell!!! Well done Zack! You’re living the dream, my friend. Thank you for sharing your experiences with us. When does Bud Selig retire? Time for you to start lining up for his job. But we’ll change the job title to King of Baseball. Hey Zack. Couple of comments on this one – Josh Rawitch is awesome. 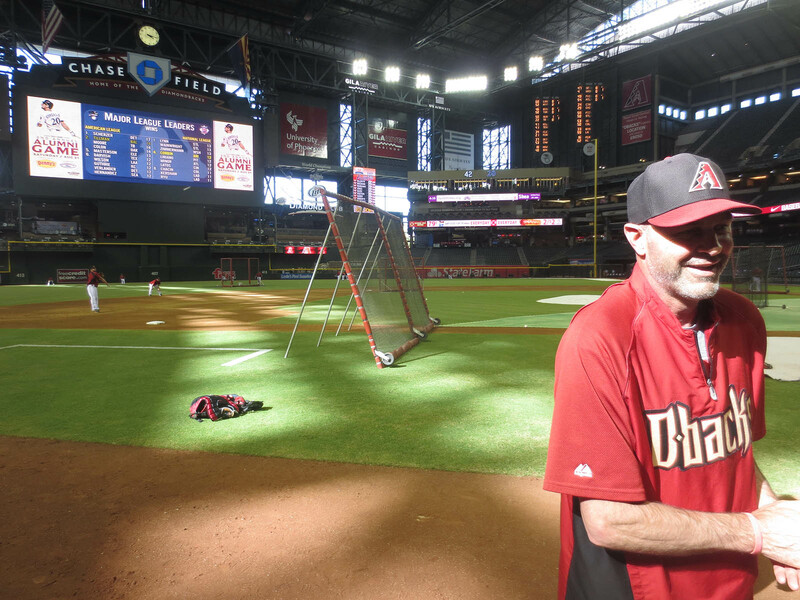 So is Pat O’Connell, who arranged my D-backs interviews for when they come to town (I’ll be at Tuesday’s game) with JJ Putz, Eric Chavez, Paul Goldschmidt, and your buddy Heath Bell. 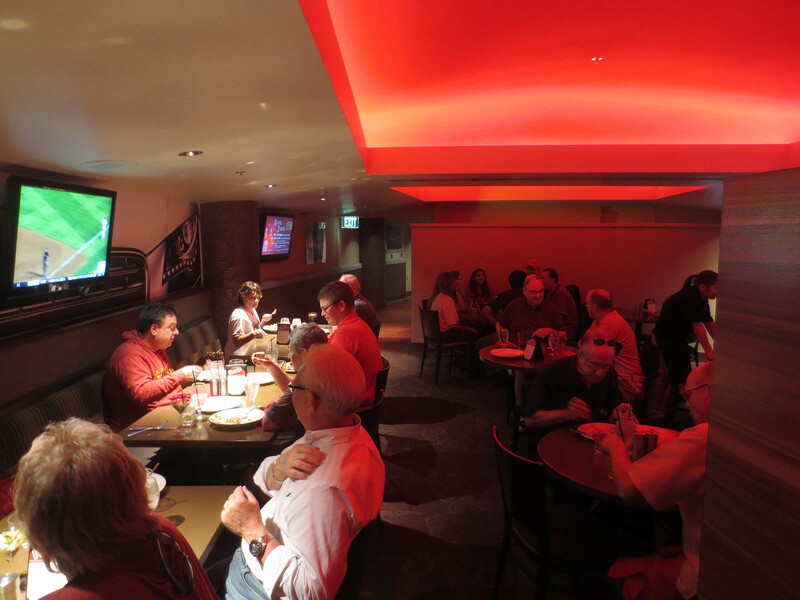 Also, GABP has the Mercedes-Benz Club…just thought that merited mention. Congrats on a stellar day at the office. Hope our paths cross soon. P.S. What’s your next book gonna be and when is it coming out? Hey Zack my last comment to deleted somehow. I was scrolling through and saw that you and I attended the same game between the Cards and the Mets back at Shea Stadium on August 22 2006. I wanted to know if I could post the photo of Albert Pujols swinging on my Instagram page. Thanks and good luck with future snags. August 16, 2013 - 3:44 pm Tommy M.
Man, i gotta say, that’s a pretty cool day you had there. From the private tour, to being in the dugout and on the field, that’s gonna be hard to top. 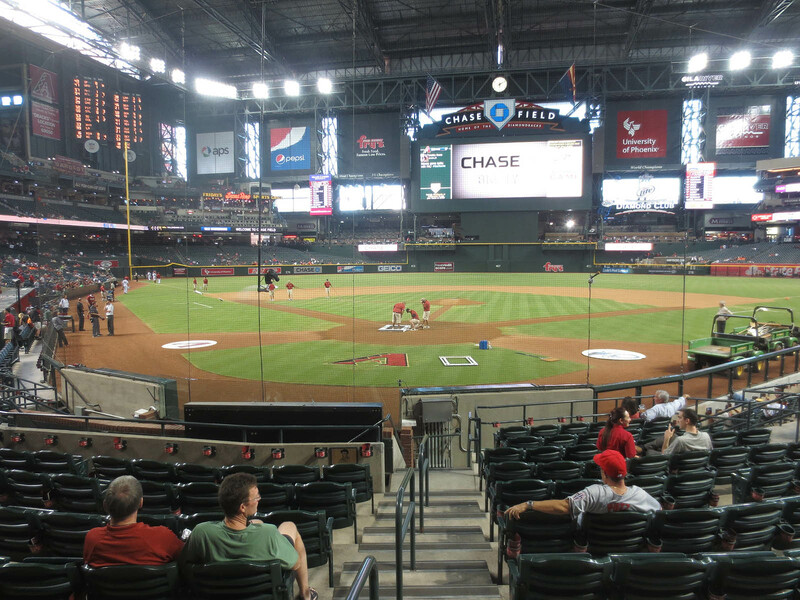 Im a Dodger fan, but i’ve been to Chase Field many times, and i share your feelings…That stadium and its employees are always great. 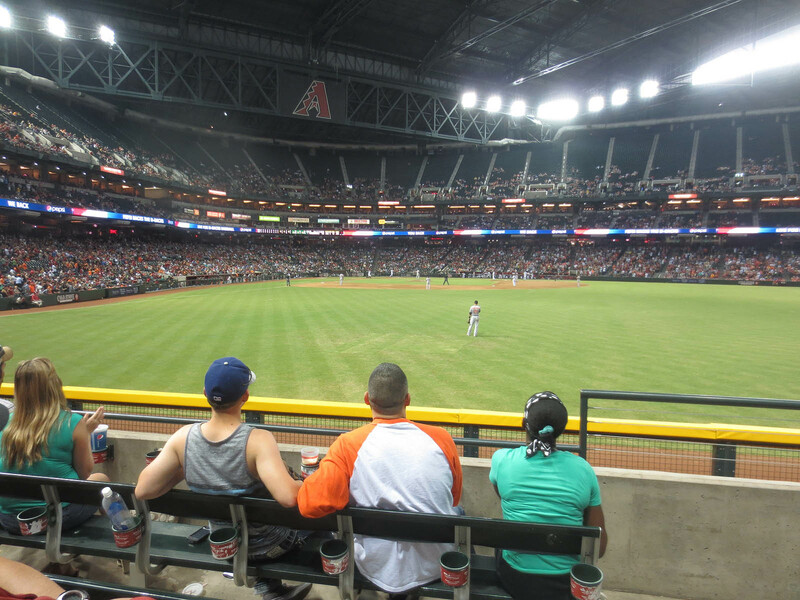 I cant wait to get back there next month for another Dbacks vs. Dodgers Series!! No closet necessary. Just go for it. I’ve used the trick there lots of times, but haven’t had many issues. It’s all about timing. Yeah, I know, but I didn’t want to overstep my bounds. You’re welcome, but just so you know, asking for autographs in situations like that is STRICTLY FORBIDDEN. You know everyone, huh? Say hi to Heath for me, if you remember. He’s the best. 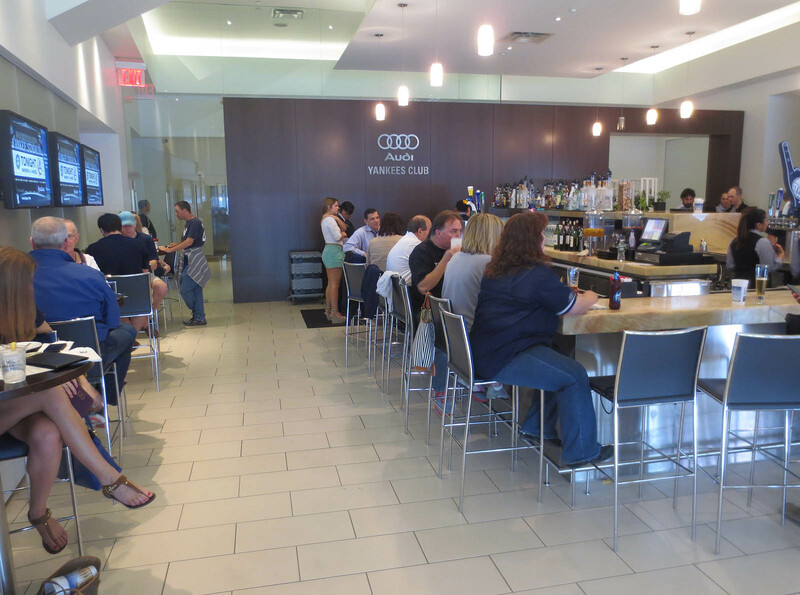 Mercedes-Benz Club . . . ha ha ha. I have no plans for another book; I’ve decided that it’s more important for me to enjoy my life. If I ever do write another, I’m going to need a lot more time and money. Otherwise, it’s just not worth it. Your other comment actually appeared on my entry from 7/31/13, but anyway, yeah, feel free to use the Pujols pic. Thanks for asking. 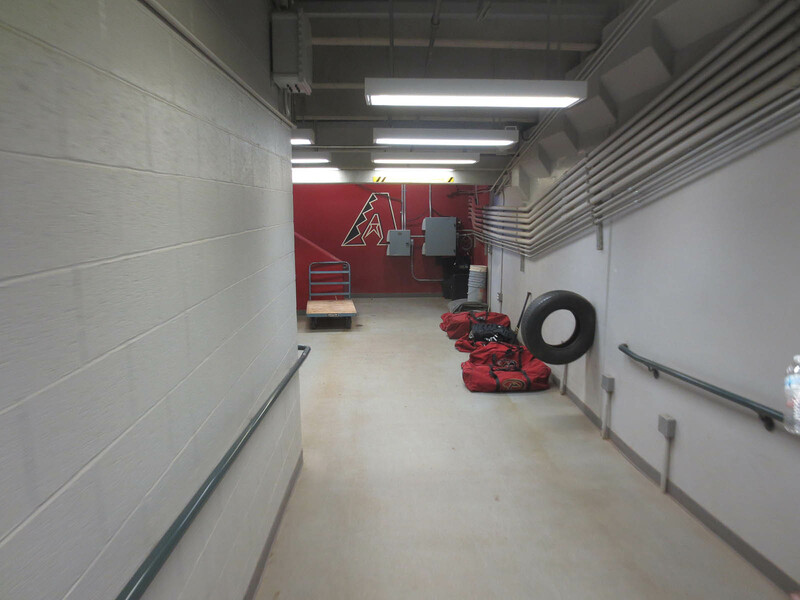 That is SO awesome they have a batting tire in the clubhouse!! I have one bolted to a tree here at the house for my boy. Develops a great swing and strong wrists. Z-Man, super entry. 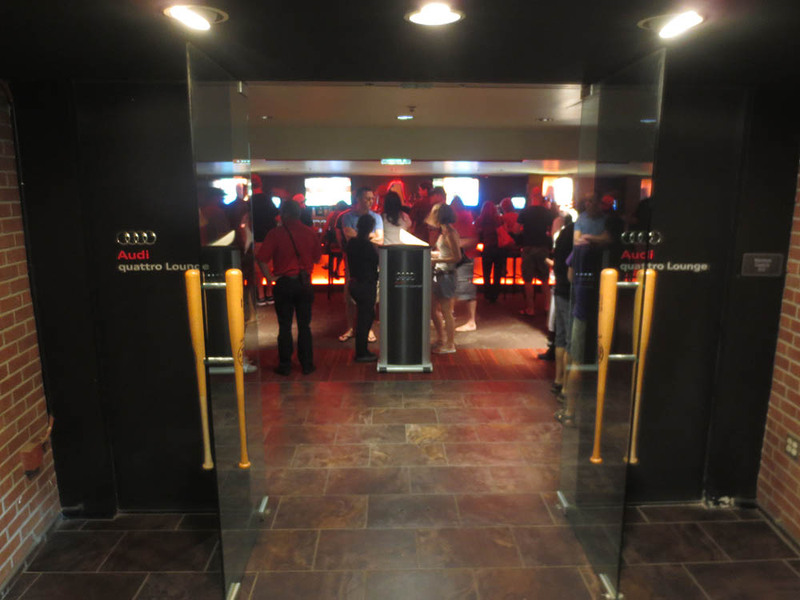 I love their facilities. I actually got a chance to talk to a member of the ownership group last year at a game in KC. Nice guy. 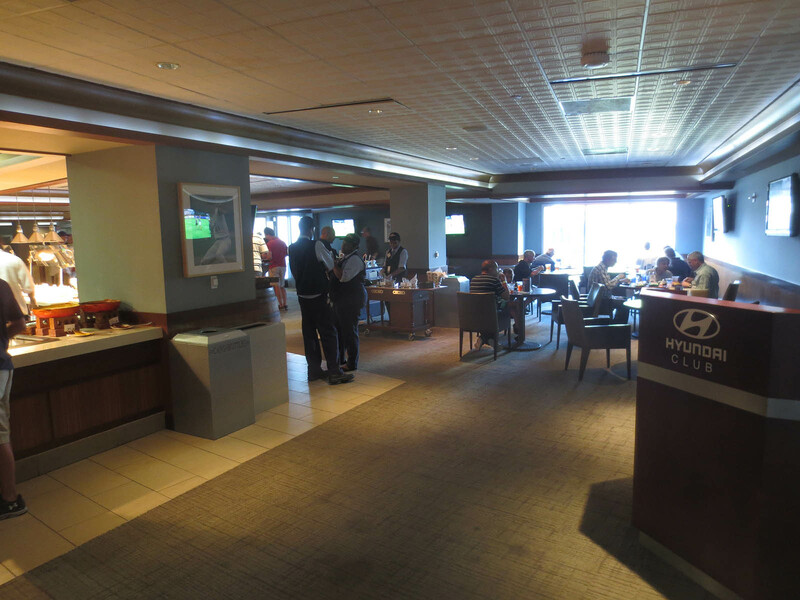 In KC, it is the KIA Diamond Club. 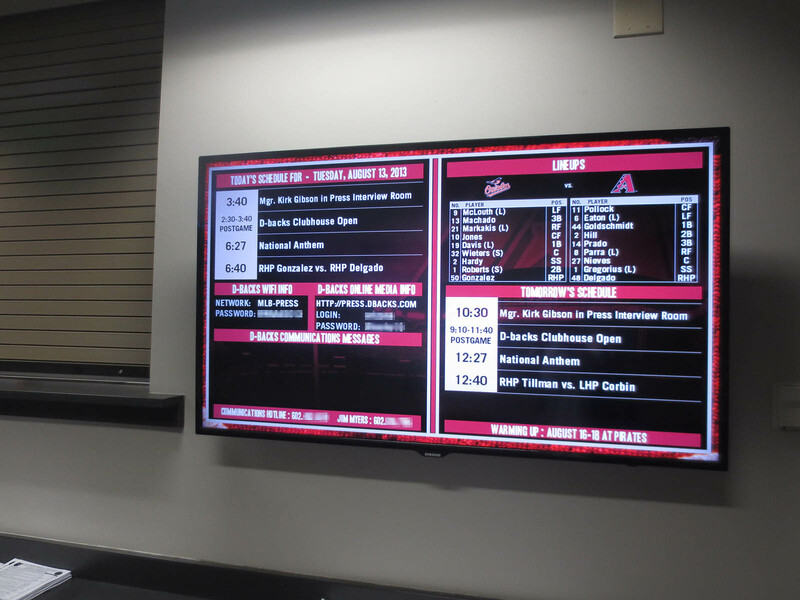 What are your thoughts on MLB enacting instant replay? I like it even though I consider myself a bit of a purist. That’s not exactly the clubhouse, and FYI, that tire is there so that when guys get pissed off, they can run down there and beat the crap out of it. I think that instant replay has great potential. It just has to be done right, and I don’t expect it to be perfect next year. Let’s all give MLB some time to iron things out. 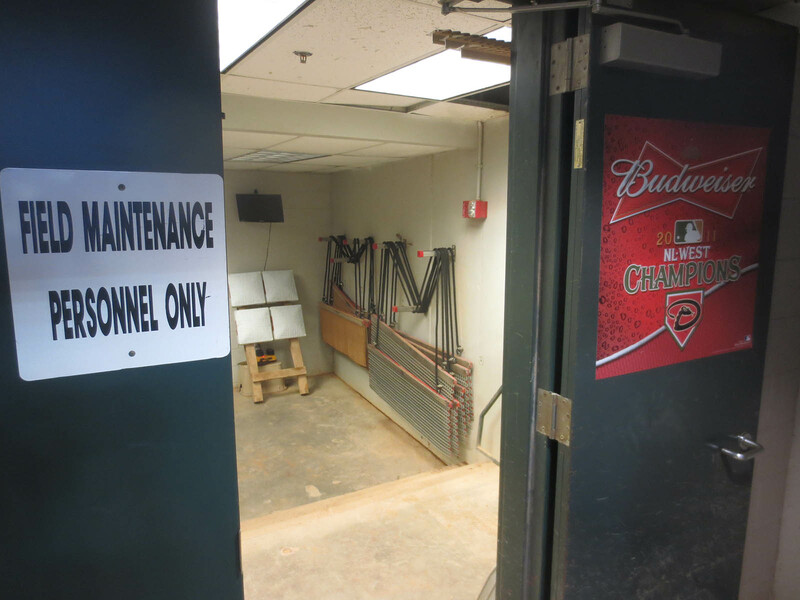 You’re making it very hard to not go here next season…..
So…you’re saying roid rage release valve/swing tuner? 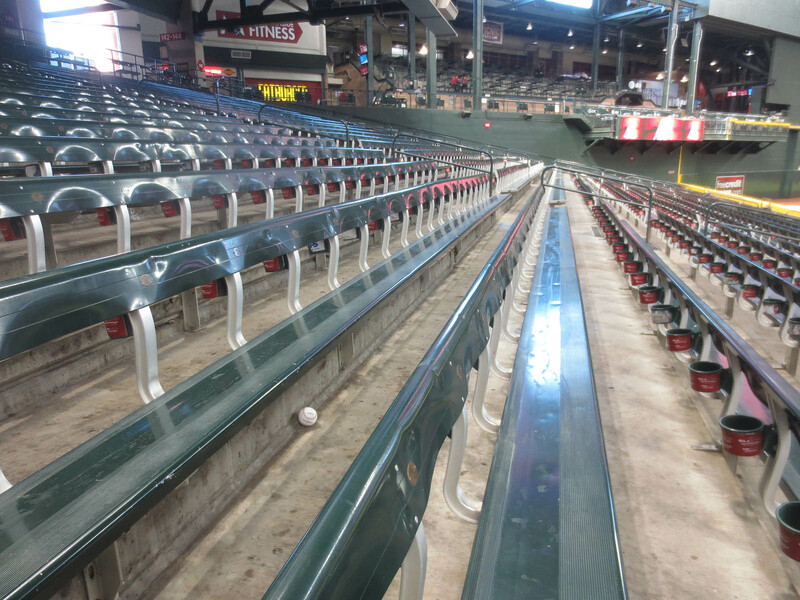 Do the balls at Chase Field feel any different when you rub them? 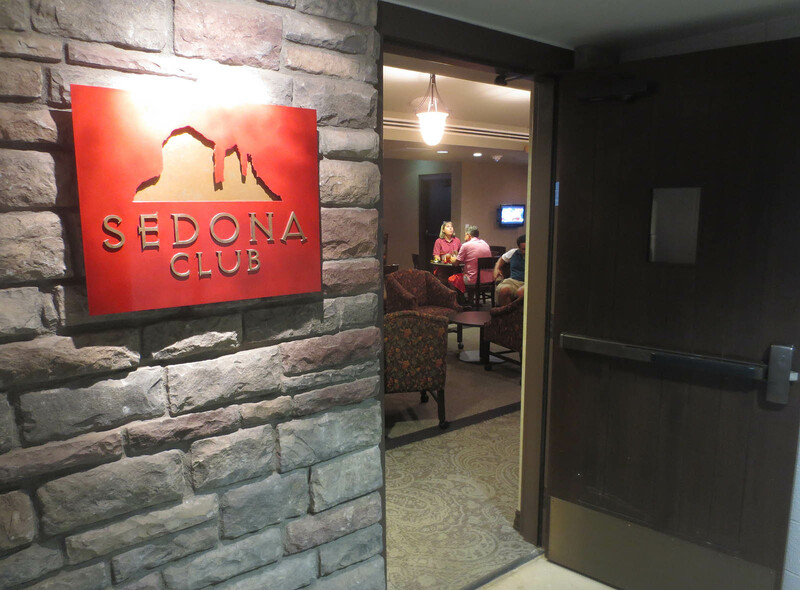 I hear they use a humidor there since the air is so dry; kind of similar to what they use in Denver for Rockies games. Good question, but I’ve never noticed a difference.